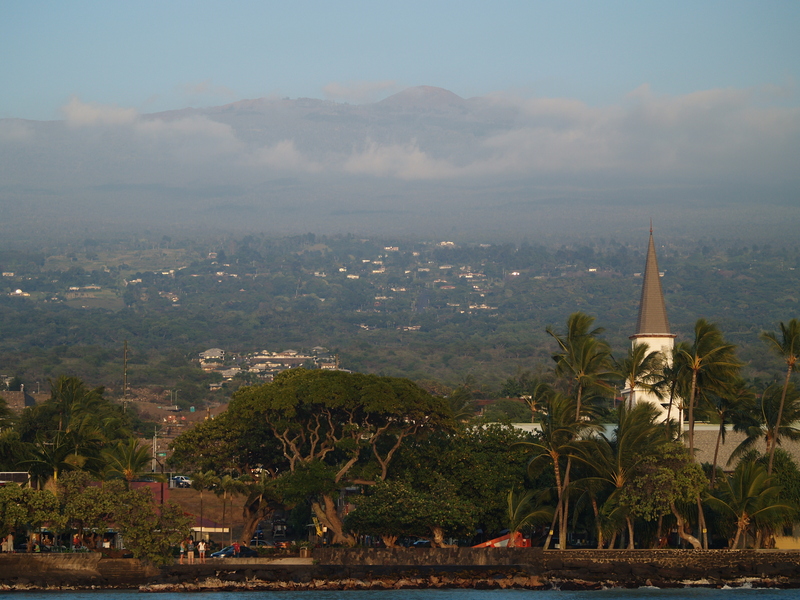 Synopsis: Headed south from Kailua Kona through the fascinating Keauhou Historic District, connect to Highway 11 and drive 20 minutes south to sample Kona Coffee. Numerous farms along the highway offer tours to discover the history and processing of this highly prized beverage. 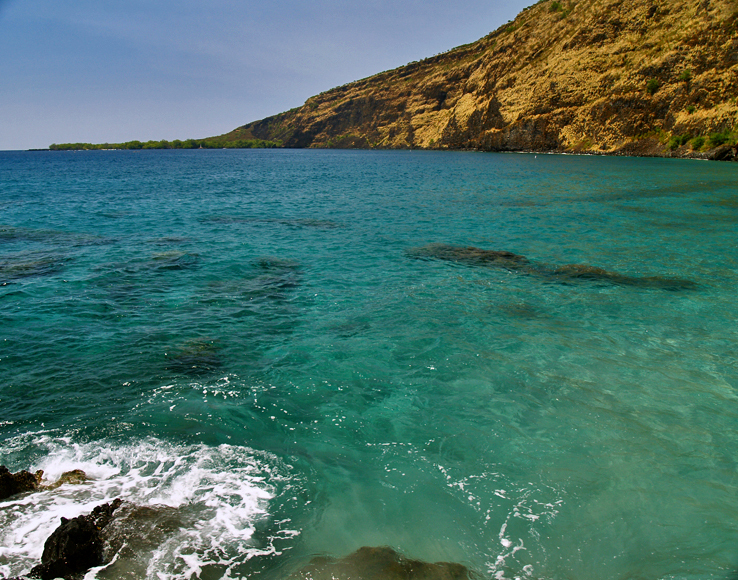 In this region are Kealakekua Bay and the Captain Cook Monument, the locations where Hawai’ian history was forever changed and the best snorkeling in the state. 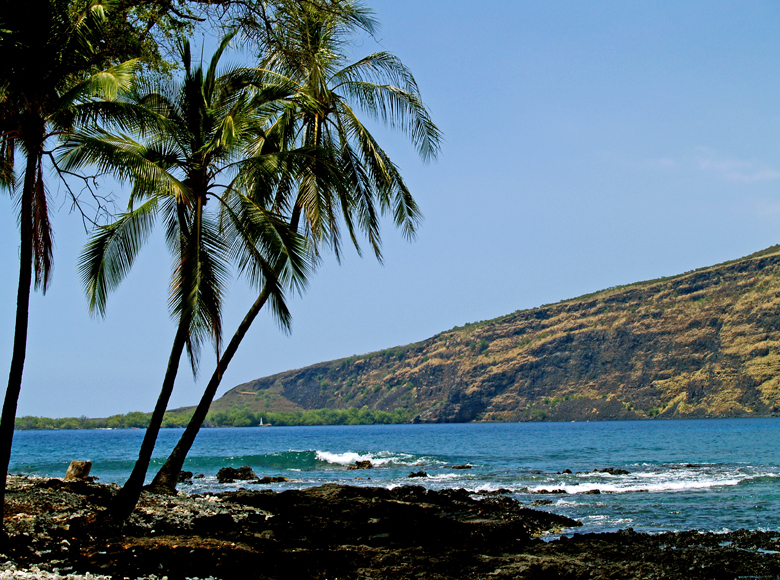 From Kealakekua State Park, follow the beach road 10 minutes to Pu’u Honua ‘O Honaunau National Historic Park. Discover why this spiritual complex was a “place of refuge”. Continuing south 1 hour, after some beach time and a short hike, is South Point Road. This is where early Polynesians arrived and started a village based on the rich fishing grounds offshore. 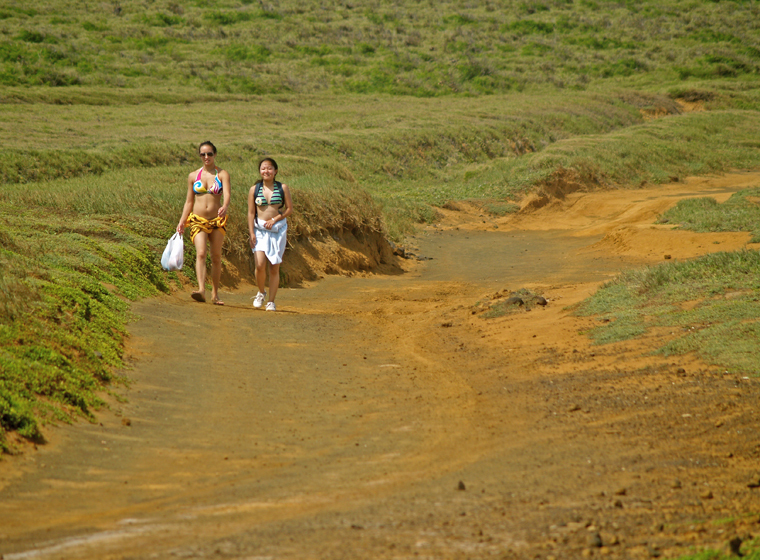 Nearby is the trail for a 3 hour round trip hike to a Green Sand Beach (bring drinking water). 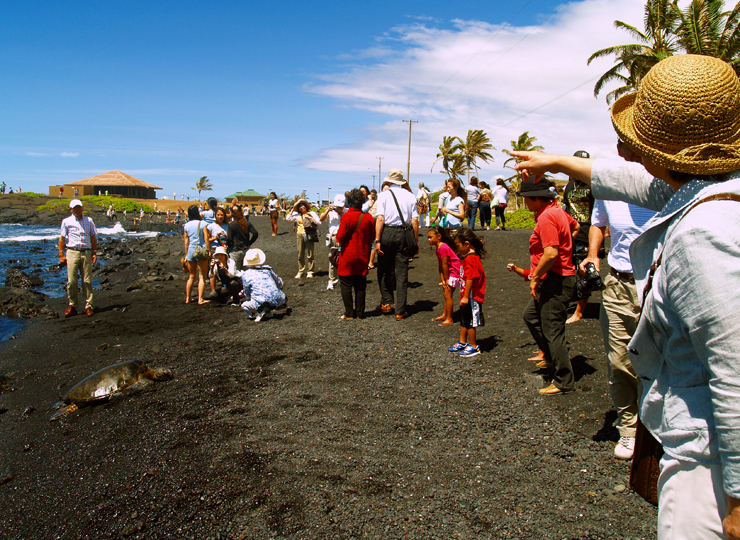 Then drive 30 minutes south to visit endangered Hawaiian Green Sea Turtles at Punalu’u Black Sand Beach. From Punalu’u it is a 2 hour drive back to Kailua Kona. Approximate minimum time start to finish (to see every site): 12 hours. 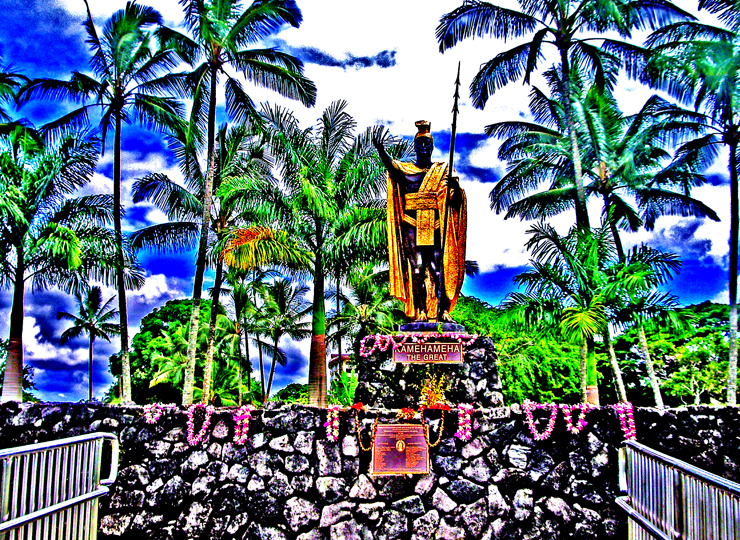 For almost 400 years, temples and palaces along the Kona coastline served as a kind of “Rome of the Pacific”, a great political, religious and cultural center in Hawaii and greater Polynesia as well, until the capital was moved to Honolulu in 1850 by Kamehameha III. 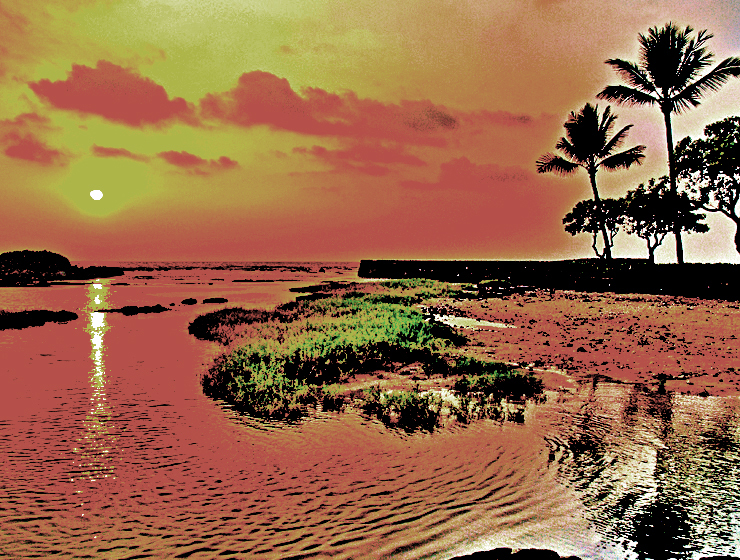 The most important, interesting and best preserved historical and cultural sites lie within the Keauhou Historic District, between Kahalu’u Beach Park in Kailua running south 6 miles to south Kuamo’o Bay in Keauhou. The District contains perhaps a dozen fascinating sites that are easy to walk to, well maintained and quite interesting. 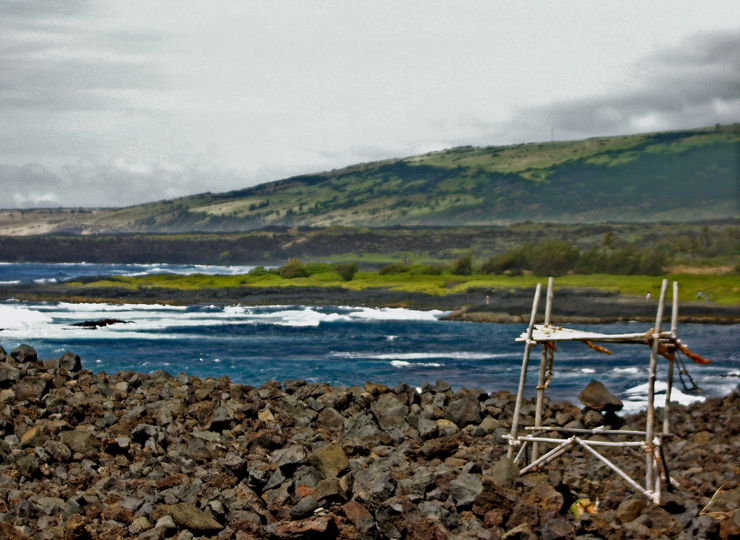 To see the numerous fascinating and important archaeological sites in the Keauhou Historic District, it is necessary to park your car in the free parking at either Kahalu’u Beach Park or the Keauhou Beach Resort and explore on foot. 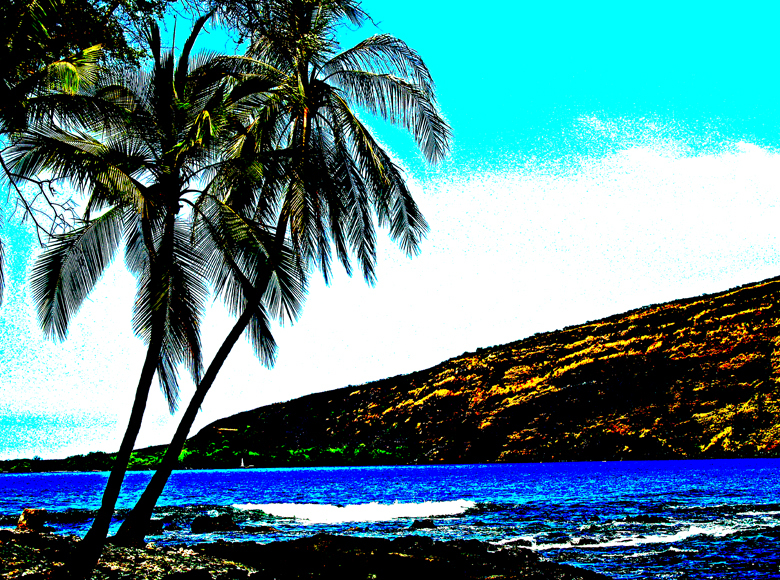 A detailed tour of the Keauhou Historic District can be found here; more information on the joys of Kahalu’u Beach may be found here. 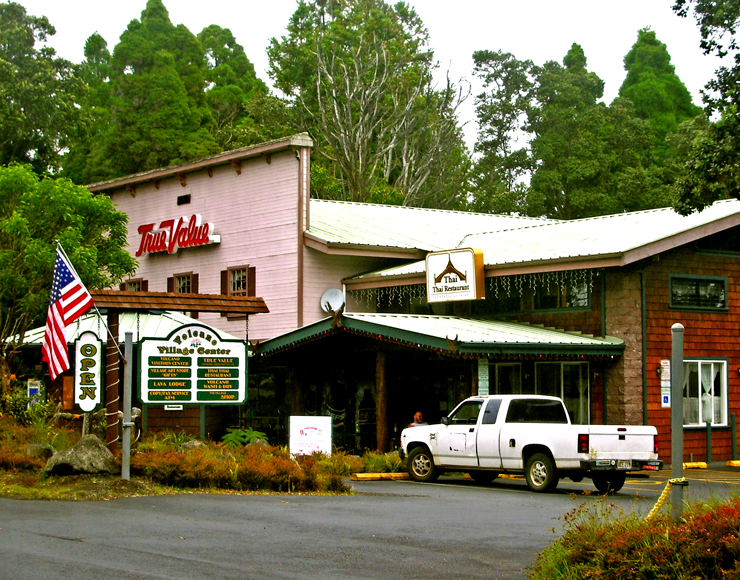 Just uphill from the Historic District is the Kona Coffee District. 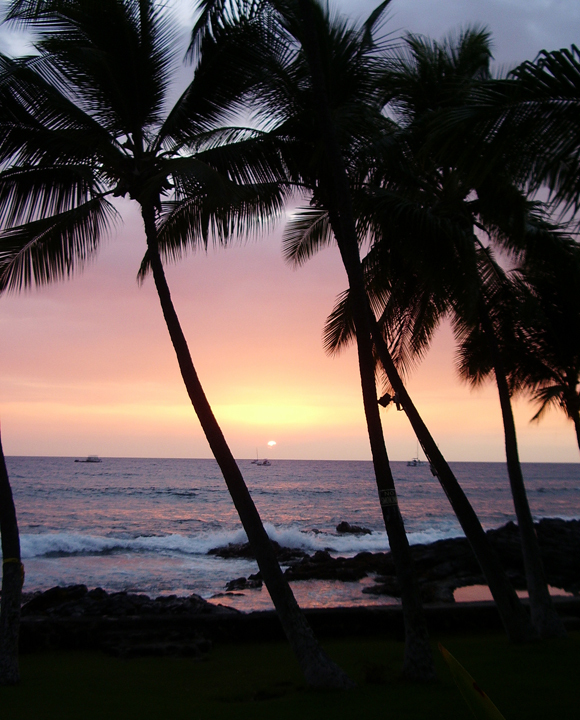 Hawaii is the only state in the union which produces coffee, and Kona coffee is perhaps the finest in the world. Over 2 millions pounds of coffee a year are produced on about 600, 2-3 acre farms; tours of coffee farms and roasteries are available. 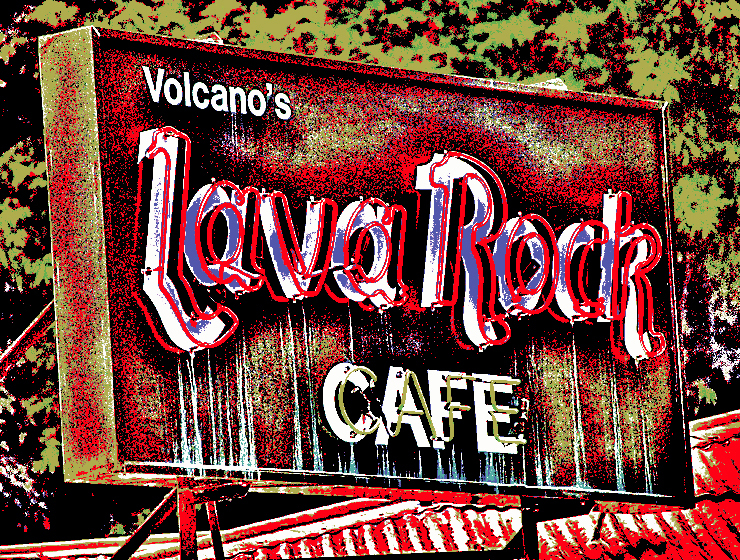 More information about Kona Coffee can be found here. 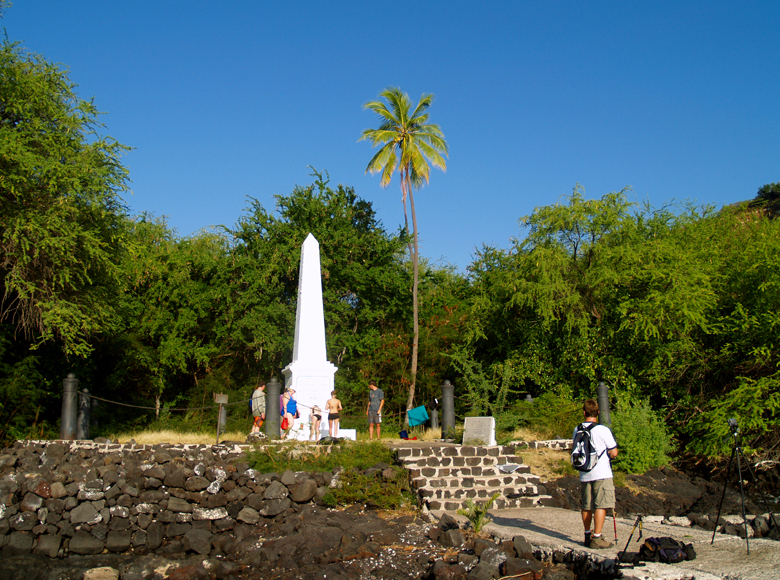 Across the bay from Napo’opo’o stands the solitary white obelisk that marks the lonely Captain Cook Monument. 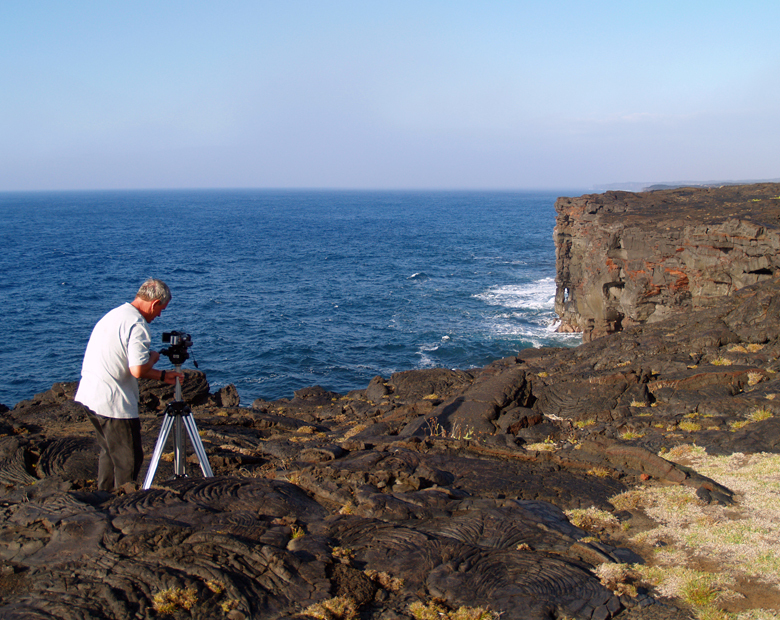 It was in this broad bay that Captain James Cook made his deepest impression on, and longest visit with, native Hawai’ians when he first arrived late in November of 1778; and it was here where he met his tragic end in February 1779 during his second visit. 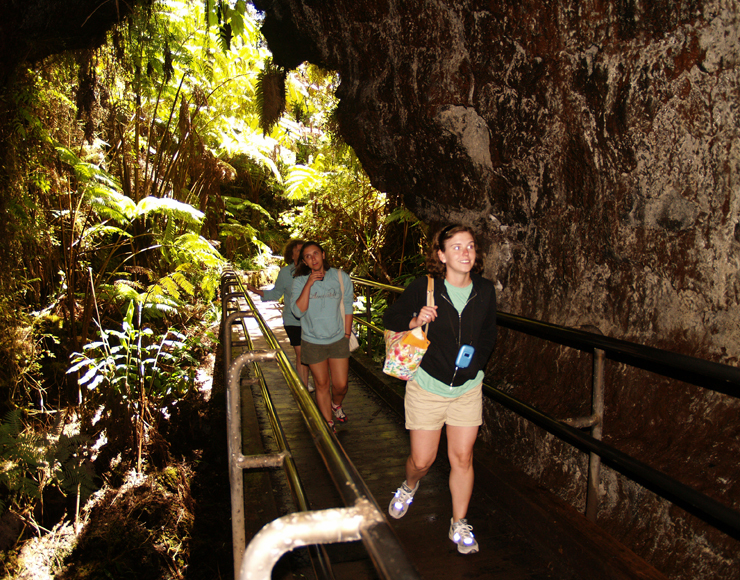 At the State Park at the end of the road in Napo’opo’o are picnic facilities, pavilions and restrooms. 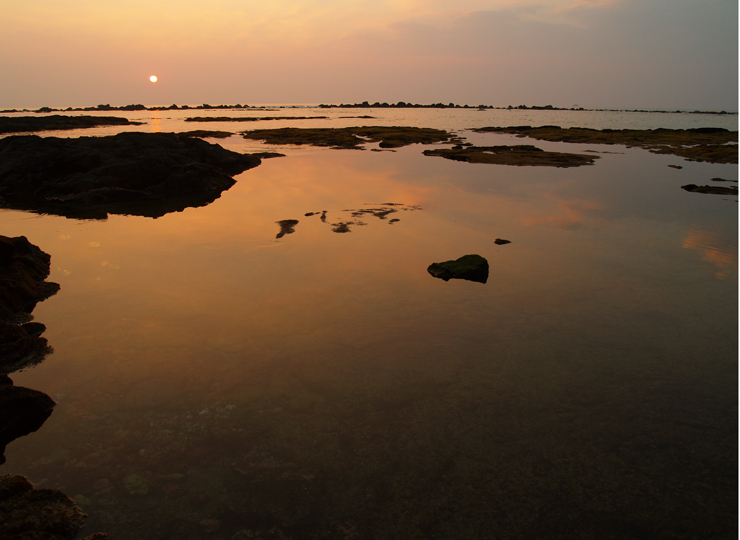 More about Captain Cook and Kealakekua Bay can be found here. 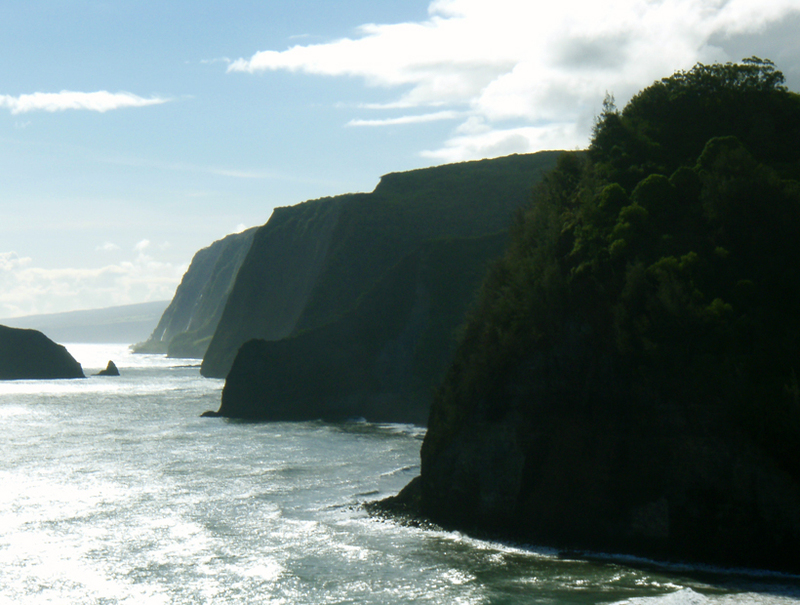 Information on how to hike to the Captain Cook Monument can be found here. 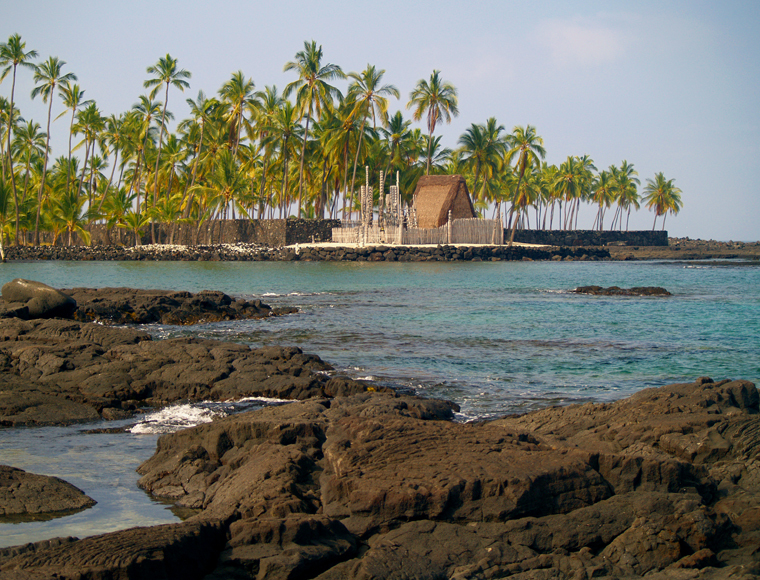 Leg 2) Head south on Pu’uhonua Beach Road to Pu’u Honua O Honaunau National Historic Park. 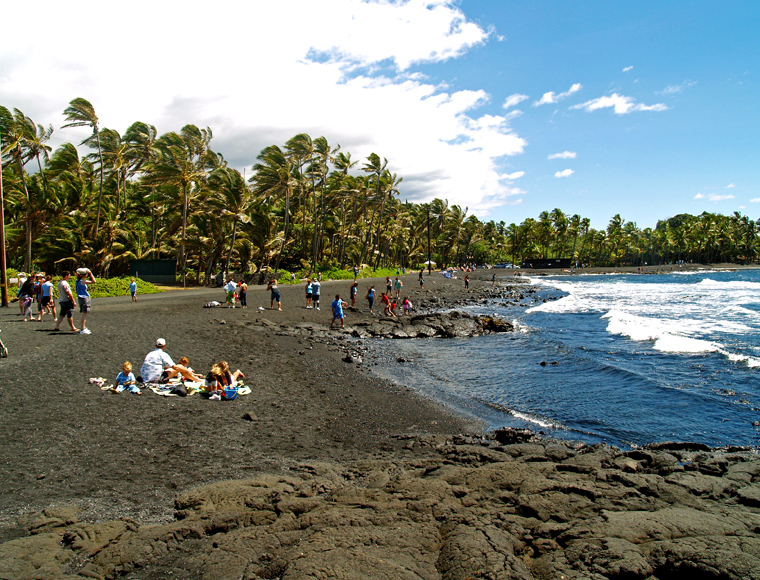 Pu’uhonua Beach Road is narrow (a lane and a half) but wildly scenic so use caution, but enjoy. Alternatively, one can reverse the drive, above, returning to Highway 11 from Kealakekua State Park, head south on HWY 11 past the small town of Honaunau, turning downhill at the junction with Highway 160, just south of Mile Marker 104 (at the Honaunau Post Office). The Park is about 6 miles down Highway 160 from the junction. 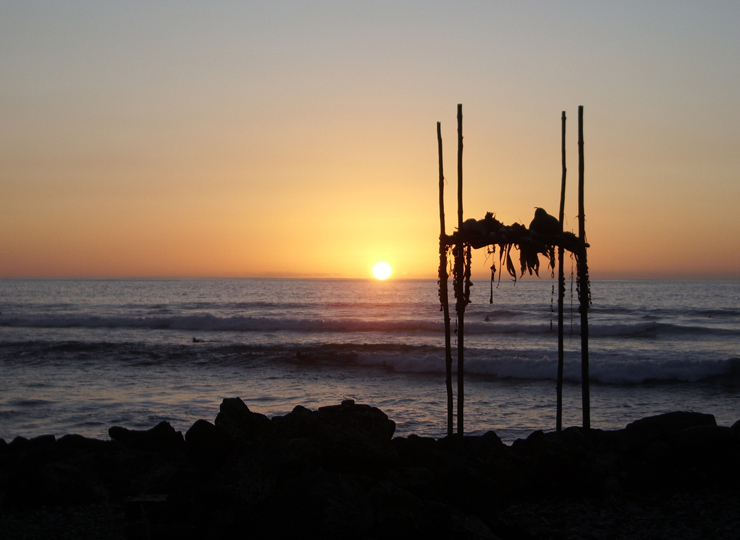 A complex and strict order of law, known as the kapu system, controlled and governed everything in ancient Hawai’i. Under this system, judgment was death, immediate and final, unless the accused could escape to one of the designated places of refuge. There the accused would undergo a cleansing ceremony, be absolved of all crimes, and allowed to return to his family free of onus. 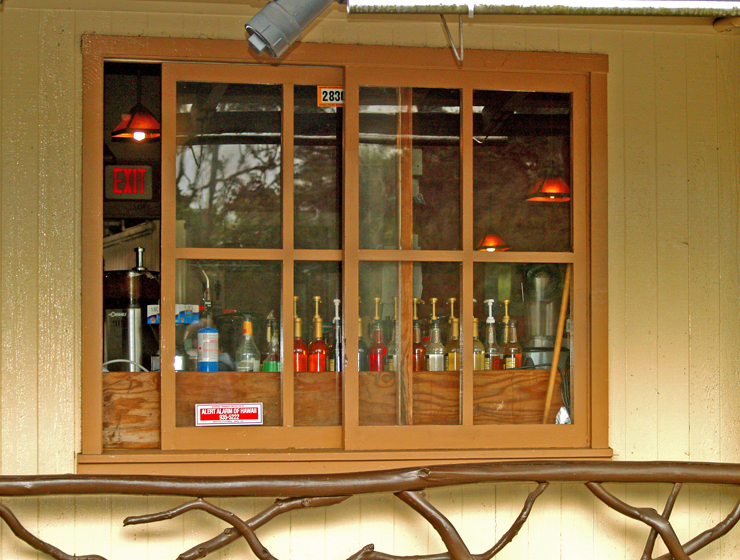 The National Park has a Visitor’s Center and bookshop, full picnic and restroom facilities. 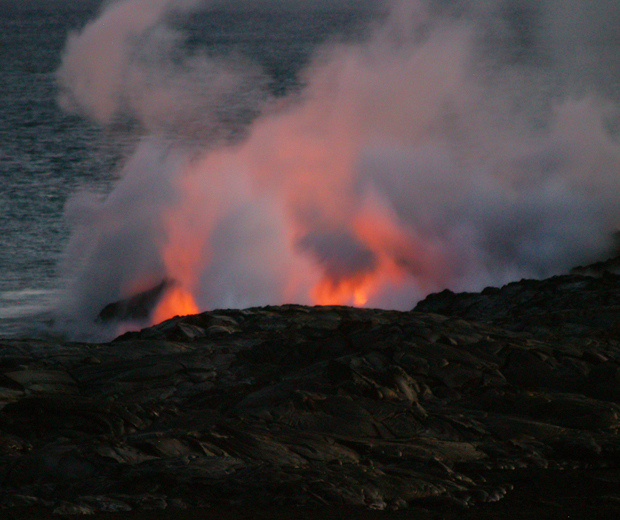 More about the history of the Place of Refuge and the interesting to see and do at Pu’u Honua O Honaunau National Historic Park can be found here. 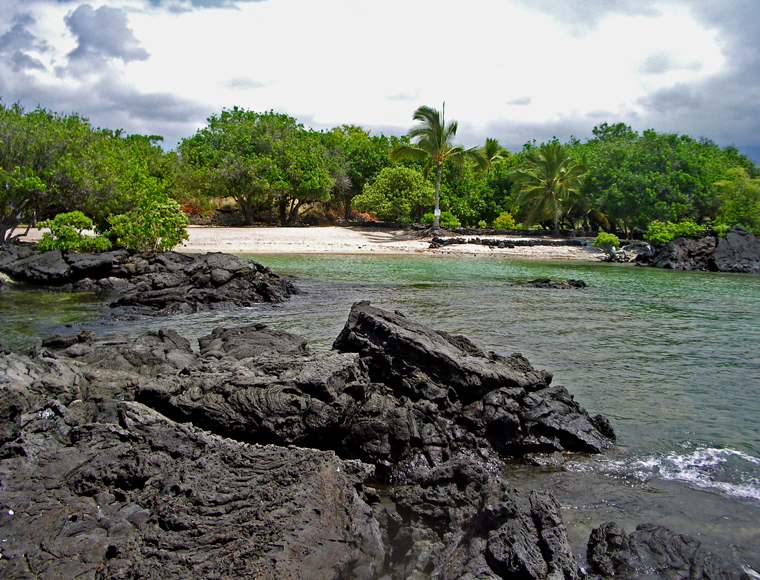 Although no swimming or snorkeling is allowed within the Park, adjacent is Two-Step Beach on Hounaunau Bay, one of the premiere snorkeling spots on the Island. 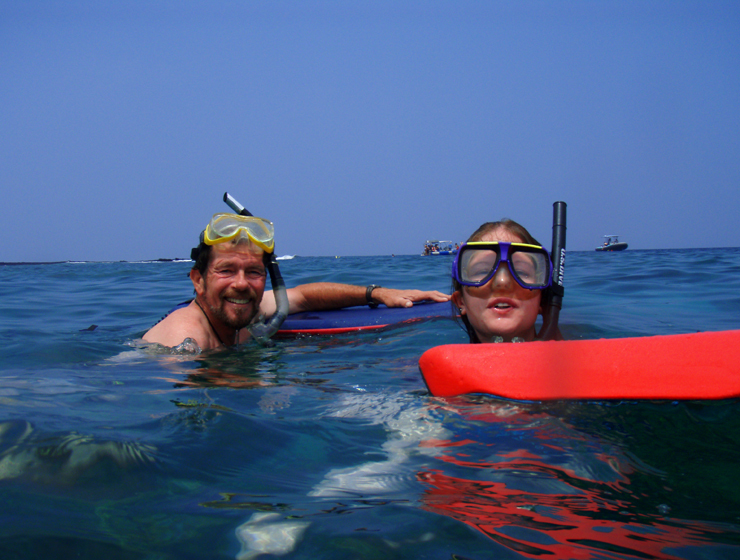 Detailed information on snorkeling at Two Step Beach may be found here. Leg 3) Return to Hwy 11 via south leg of Hwy 160, continue south on Hwy 11 to Ho’okena Beach Road; Ho’okena Beach Road west to Ho’okena Beach. 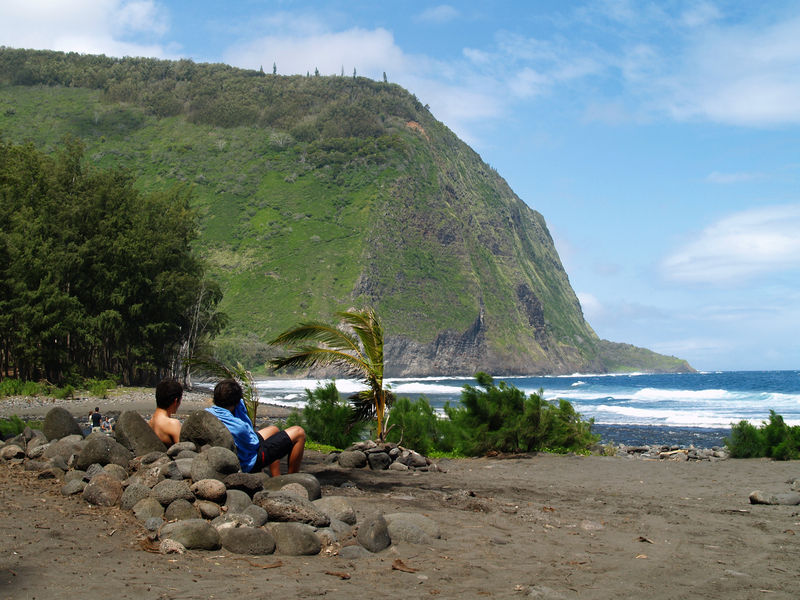 Brilliant snorkeling, decent boogie boarding, passable shell collecting and wonderful camping—it’s a wonder Ho’okena Beach is not more popular with visitors. 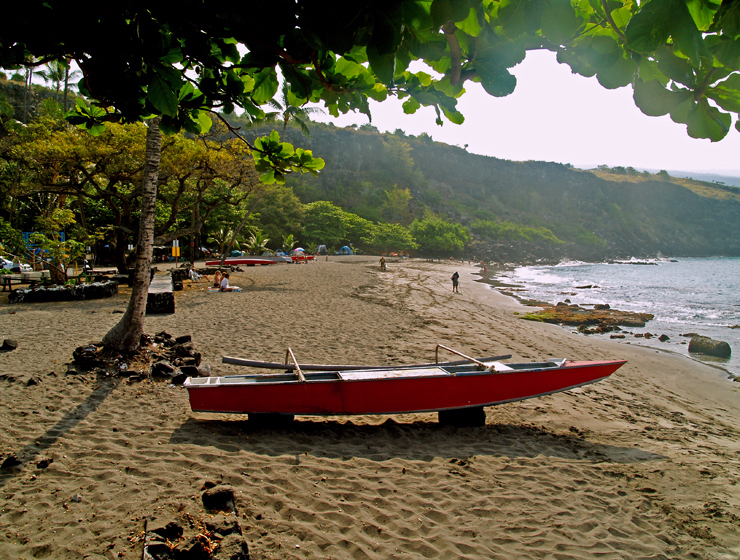 Nestled alongside the ruins of Ho’okena Village, this beach is a wonderful place to spend a morning or a weekend. 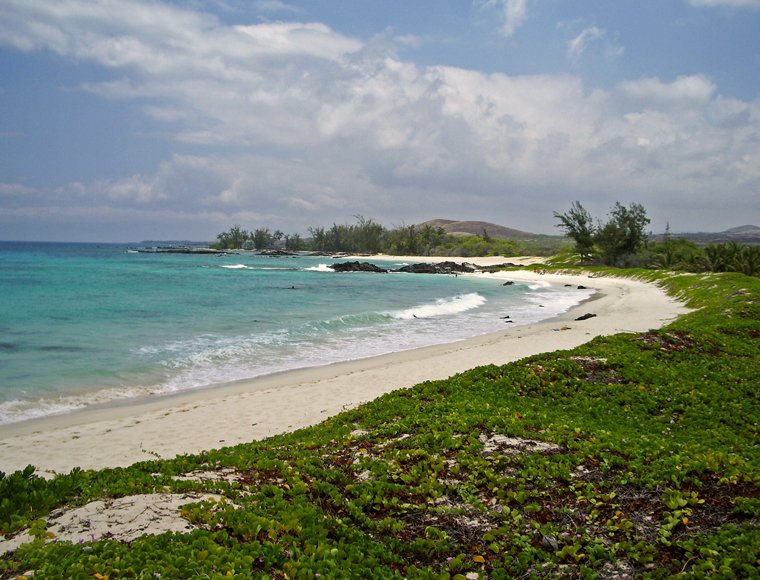 Frequented by dolphin, stuffed full of pelagic and reef fish and turtles and boasting crystal clear, warm and calm waters, Ho’okena is a must-see beach for avid snorkelers and divers as well as sea kayakers. During the winter months, female Humpback whales and their babies frequent the waters off this bay. Wonderful beach camping, new showers and restrooms, picnic tables and abundant fresh water make this county park a gem. 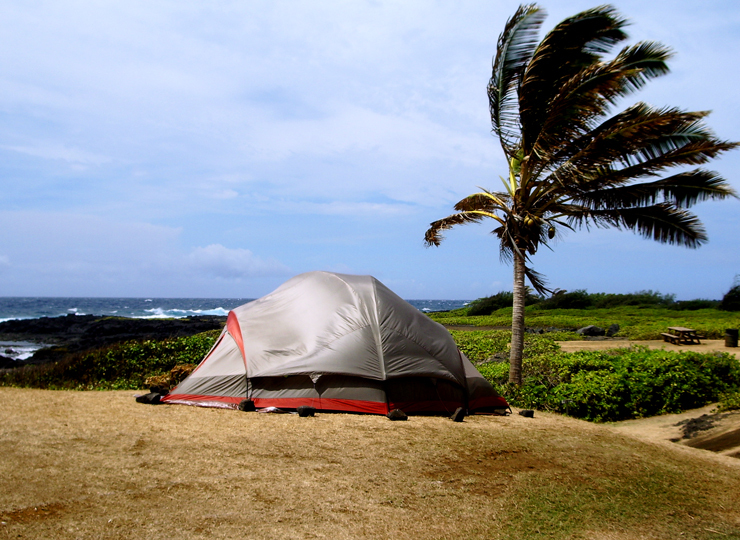 Camping is by permit only on a first come-first served basis. 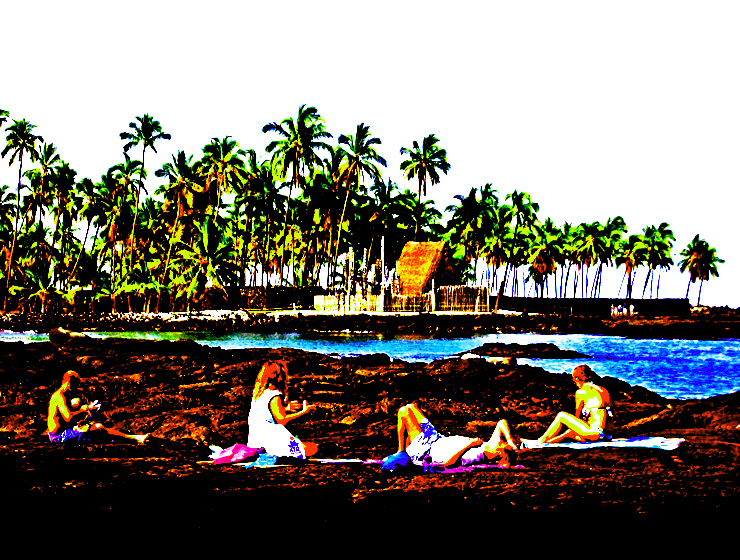 Much more about Ho’okena Beach is available here. Leg 4) Return to Hwy 11 via Ho’okena Beach Road; continue south on Hwy 11 to Miloli’i Road; Miloli’i Road to Miloli’i Beach Park; trail to Honomalino Beach. A true gem of West Hawai’i and rarely crowded, Honomalino Bay is reached by a 20 minute hike from the south end of Miloli’i Beach County Park. 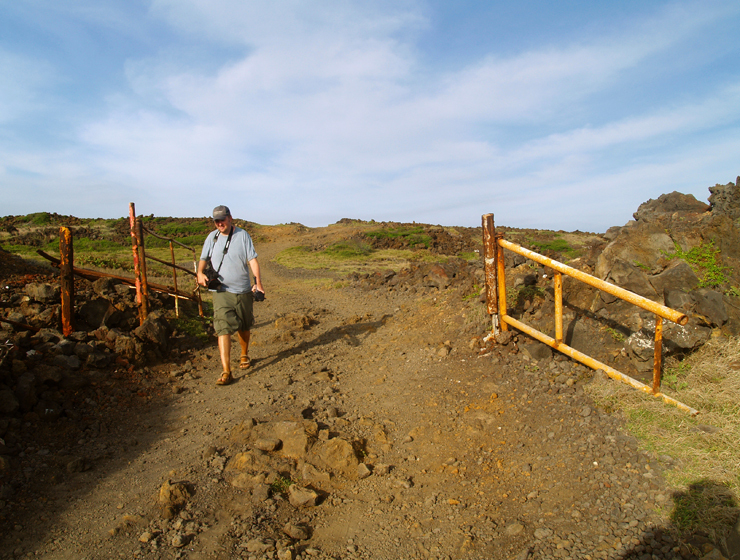 The hike starts between the bathrooms and a yellow church and is always along the right fork of the trail, in and out of the surf line, to avoid private property. 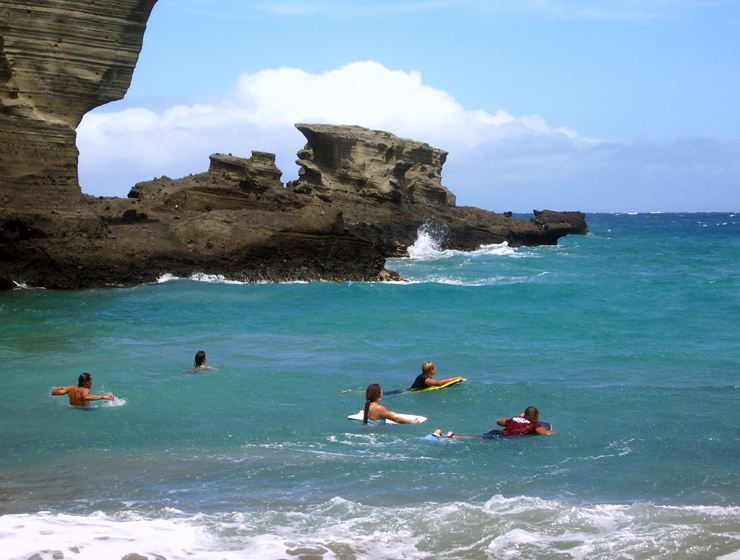 Snorkeling is very interesting on the north side in the rocks, when the surf is low. 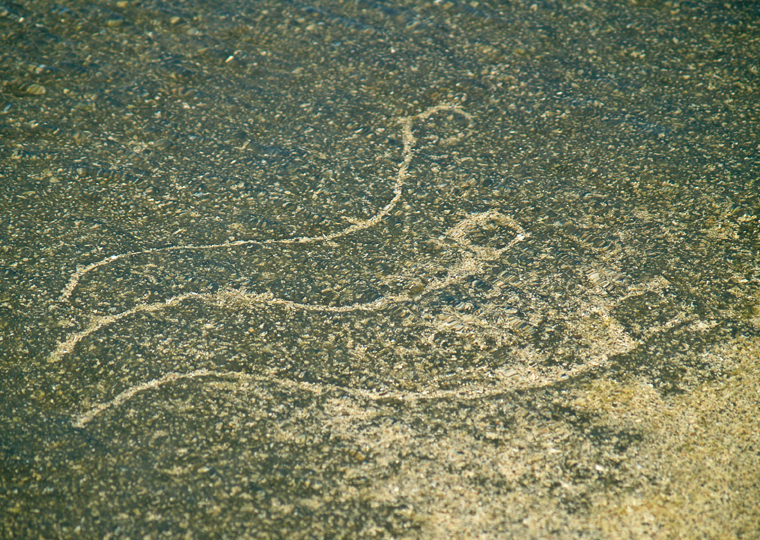 The water, though very clear, is sometimes quite cold due to spring discharge in the sand on the beach. There are no services here, leave no valuables in your car. 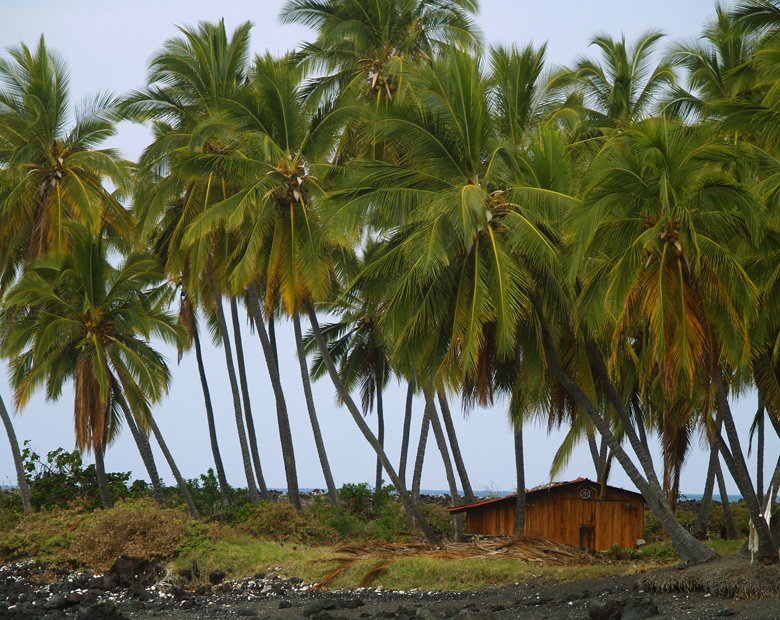 Detailed information about visiting Miloli’i and hiking to, and snorkeling at, Honomalino Beach can be found here. Leg 5) Return to Hwy 11 via Miloli’i Road and continue south on Hwy 11 to South Point Road; South Point Road to South Point. Haunting, windswept, wild, empty, beautiful. Imagine the gratitude and wonder of the first Polynesians who, after voyaging at sea without sight of land for more than a month, finally made land here at Ka Lae. Polynesians established a thriving colony based upon the incredibly rich fishing grounds just offshore. South Point is the farthest point south in the entire United States. The road to Ka Lae from the Hawai’i Belt Road is infamous although greatly improved in recent years; check your rental agreement before driving here. There are no services…plan and act accordingly. Much more information on the incredible history and sites of South Point is detailed here. Leg 6) Head back north on South Point Road to Kaulana Boat Launch Road; take road to boat launch, Green Sand Beach trail to Green Sand Beach. 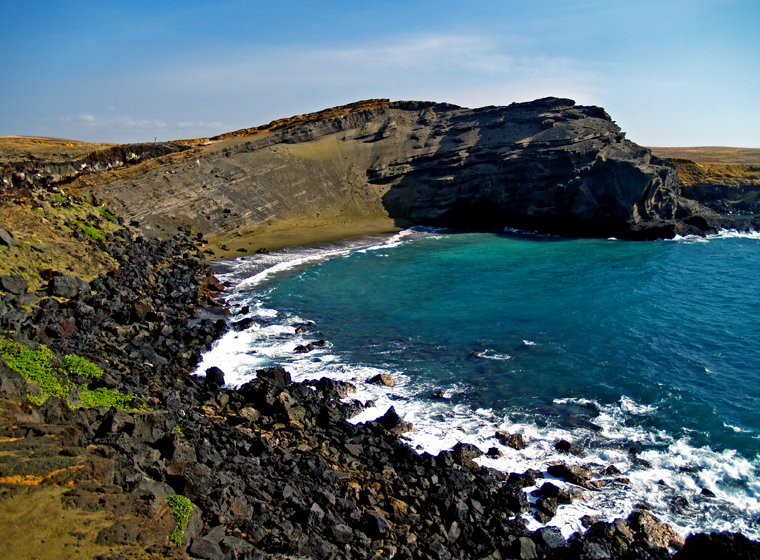 Absolutely unique to the island of Hawai’i are the handful of green sand beaches composed of crystals of the semi-precious mineral olivine (also known as peridot). 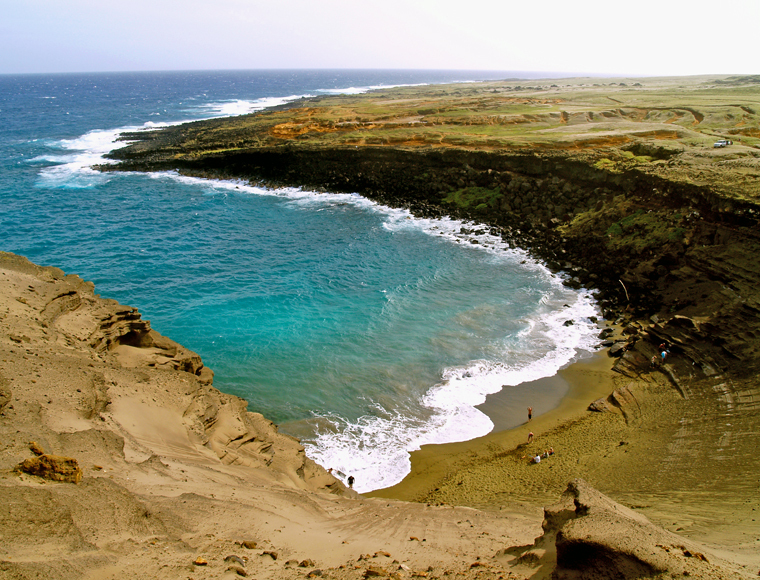 The green sand beach at South Point is the best known, largest and most accessible of these. The bizarre color of the water shrieks for underwater photographs. 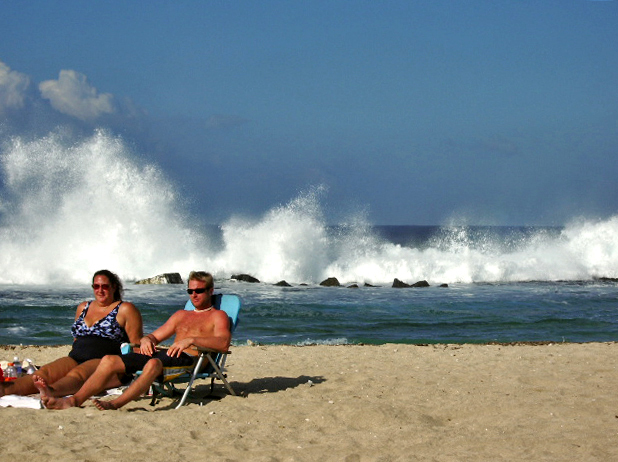 Watch for strong currents; do not go out far nor if the surf is high or there are strong winds. 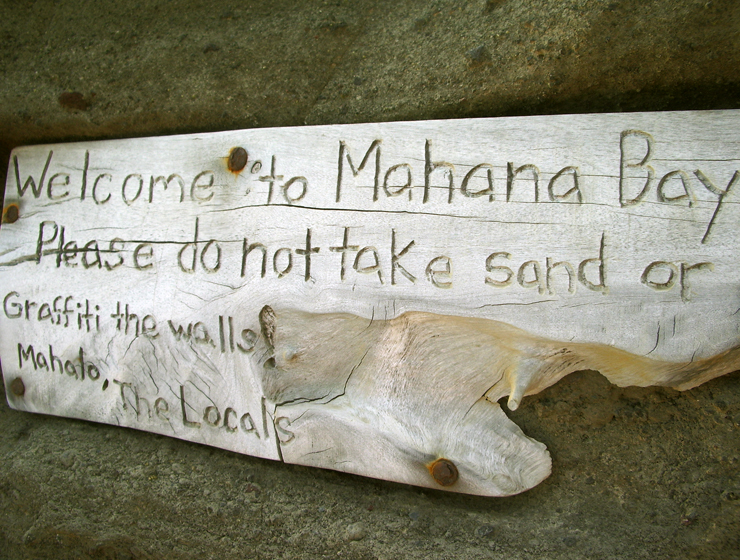 To get there, follow signs to Kaulana boat launch; park left (south) of the boat launch. 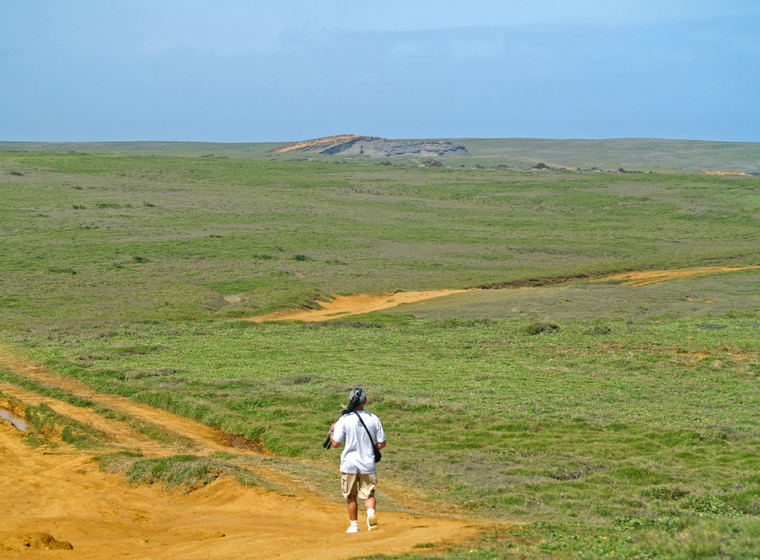 Hiking distance is 2 ¼ miles each way along rolling tropical prairie. 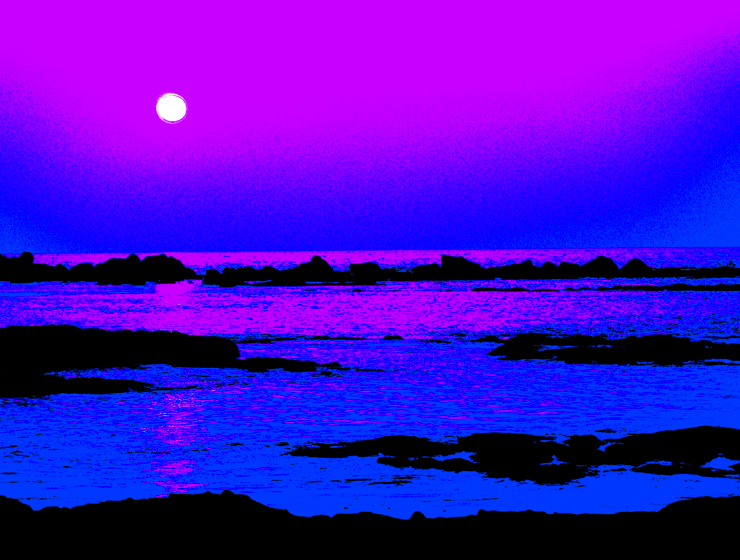 Stay in sight of the shore and you cannot get lost. 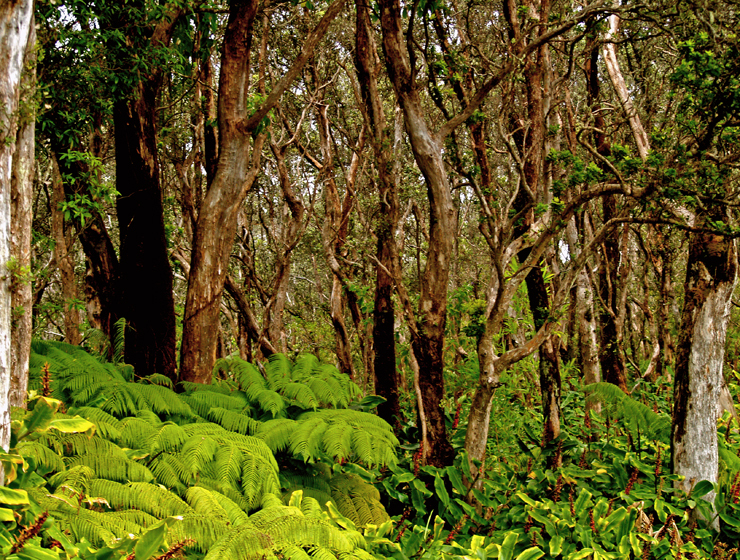 Although tricky to spot on the way down, from the beach looking up the way back to the crater rim is easy to follow. There are no services here; plan and act accordingly. 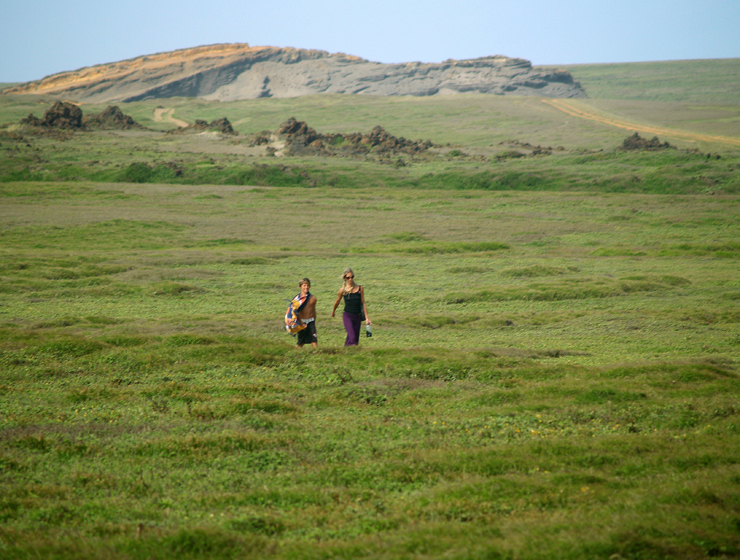 Details and more information on hiking to the Green Sand Beach can be found here. For an explanation of the fabulously unique origins and geology of the various colored sand beaches on the Island of Hawaii, please go here . Leg 7) Return from Kaulana Boat Launch Road to South Point Road to Hwy 11; proceed southeast on Hwy 11 to Punalu’u Road; Punalu’u Road to Punalu’u Black Sand Beach Park. Available services include water, picnic tables, restrooms, electrical outlets, and pavilions, parking; camping is by permit only. 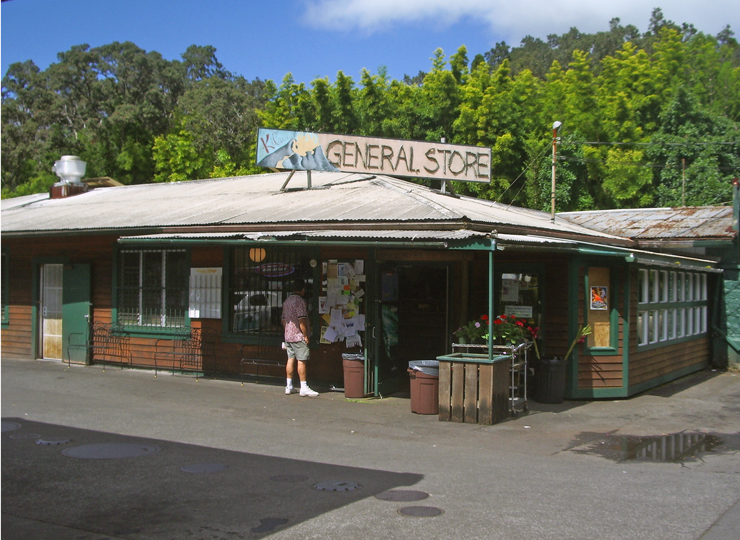 During peak tourist time, there is a souvenir stand with some packaged food items and canned drinks for sale, otherwise the nearest food, gasoline and other services are in either Pahala to the northeast or Na’alehu to the southwest. 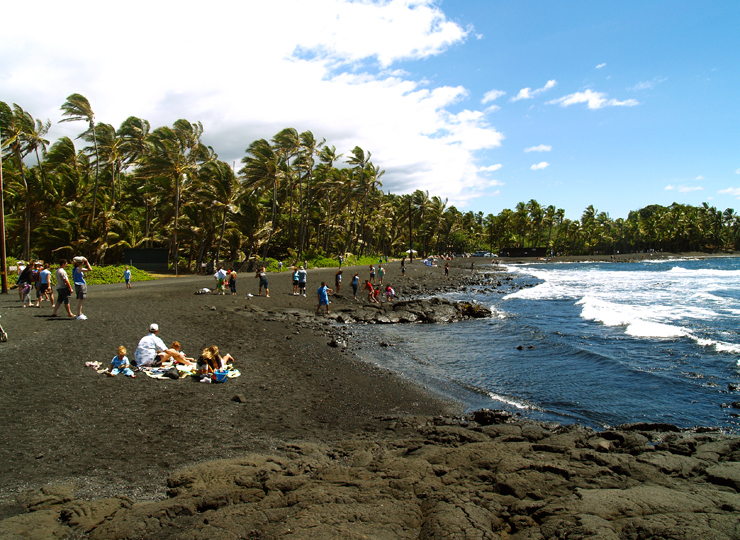 The more information on visiting Punalu’u’s black sand beach, the Hawai’ian Green Sea Turtles as well as the rich natural history and archeology of the area, may be found here. For an explanation of the fabulously unique origins and geology of the various colored sand beaches on the Island of Hawaii, please go here. 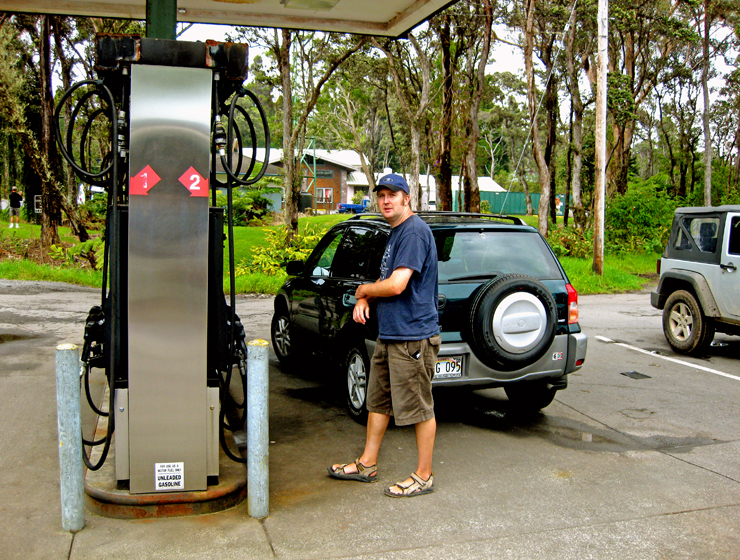 Leg 8) Return Punalu’u Road to Hwy 11; take Hwy 11 west and north to Kailua Kona. 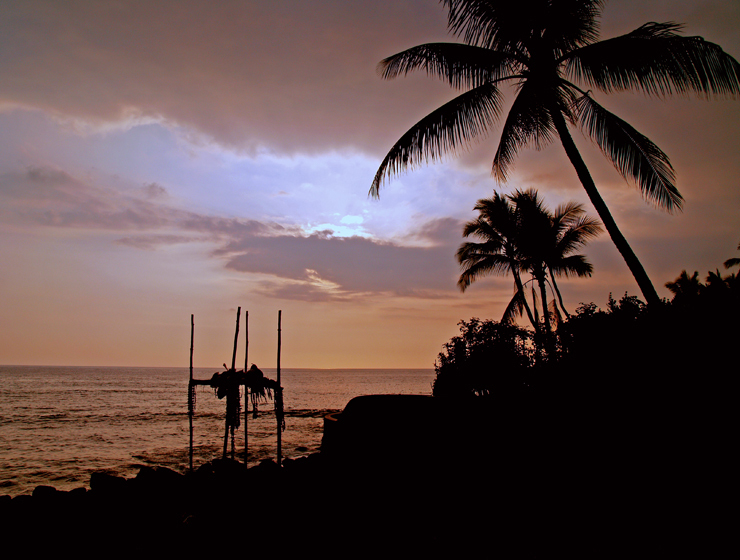 If you find yourself back in Kona Town with your spirit of exploration and discovery still running high, check out this walking tour of Kailua Kona, discussing the ancient and modern history of this sleepy little fishing village-turned-tourist mecca. New at iTunes: Hawaii Dream Vacation iPhone/iPod Touch App Puts the Magic of Hawaii in the Palm of Your Hand, available at iTunes or http://www.tourguidehawaii.com. Navigate to all the most popular visitor destinations, the most interesting attractions, the most romantic and secluded beaches; effortlessly find hikes, snorkel spots, historical and cultural landmarks, shopping and dining. And of course, our new App includes directions to, and rating of, all the public restrooms! Learn all about it, here. In addition to real GPS navigation, this app also allows you to navigate using Google Maps or, if no internet or phone service available, with on-board maps and driving directions! 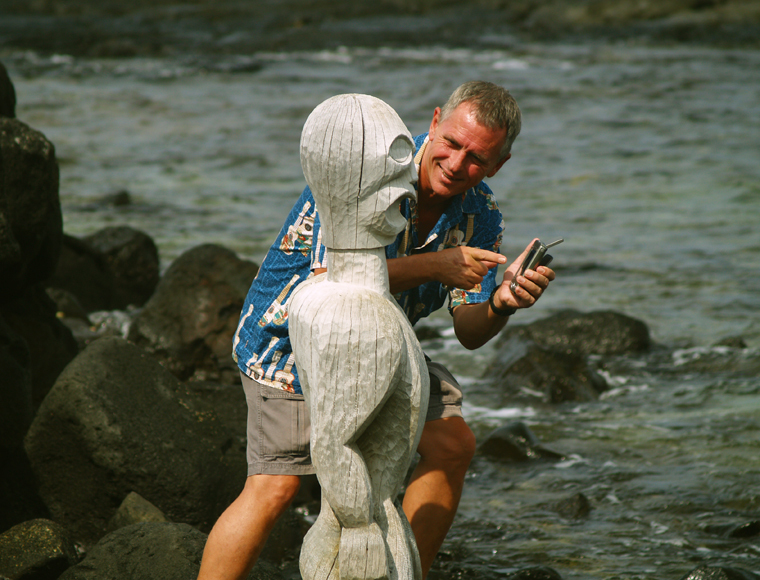 Our App is crammed full of entertaining and informative video presentations about how and where to snorkel, the best trails and beaches, what to pack to bring to Hawaii, cultural orientation and language tips! 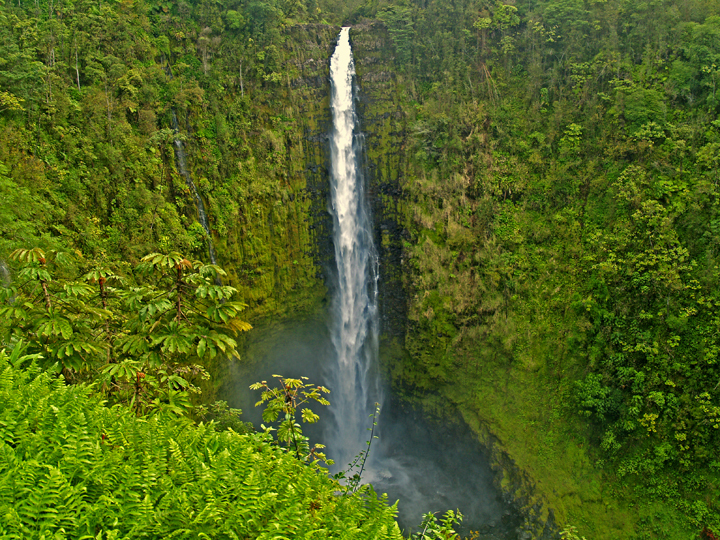 Using the Tour Guide Hawaii iPhone/iPod Touch App will save you time, save you money and allow you to see and do more with your Hawaii vacation; this quick video tells you how. Interested in seeing what kind of information our App contains? In celebration of the release of our new App, we proudly present this list of blogs and web articles on Hawaii Travel, with URLs, of the unique and comprehensive Tour Guide Hawaii content. Enjoy this free information at your leisure, and order your App from iTunes, today! 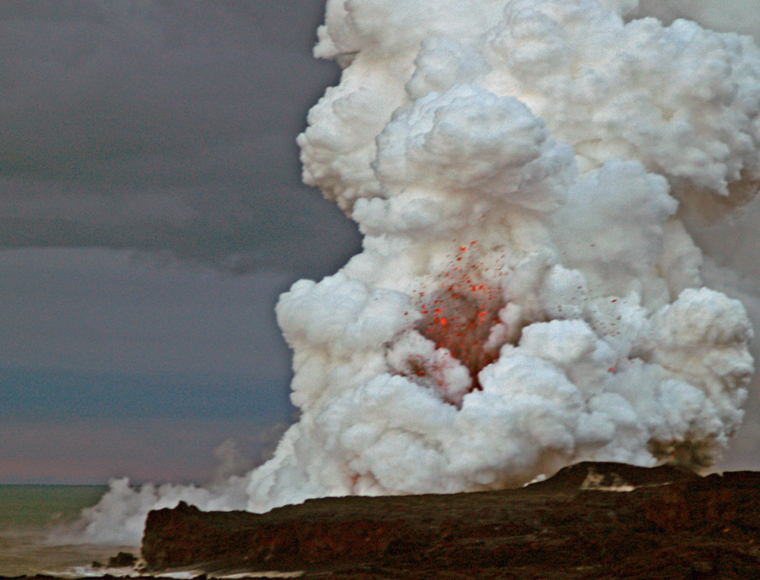 Tour Guide Hawaii proudly presents the best, the most interesting, the most comprehensive material on Hawaii travel ever gathered in one place! 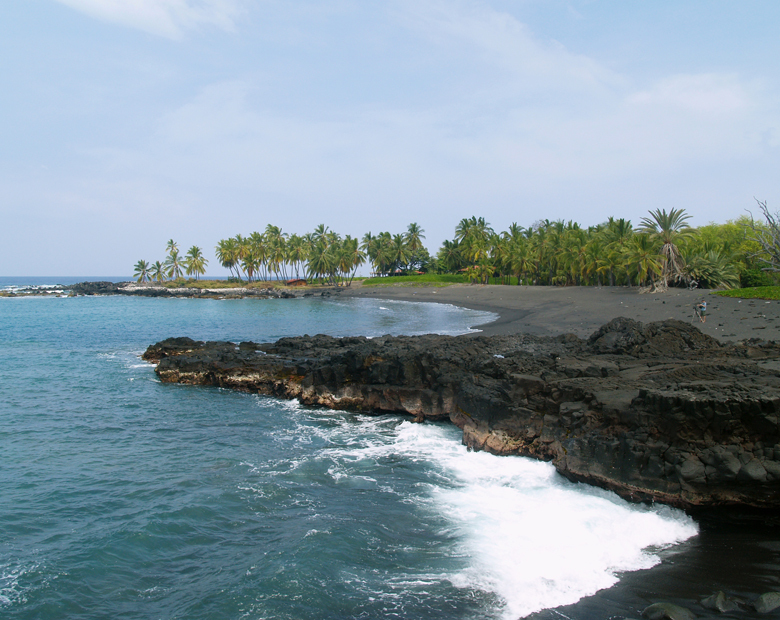 A truly remarkable place of great peace, beauty and spiritual healing, Punalu’u’s black sand-lined coves and beaches are world-renowned. Dozens of endangered Hawai’ian Green Sea Turtles swim the waters frequently basking on the beach here. 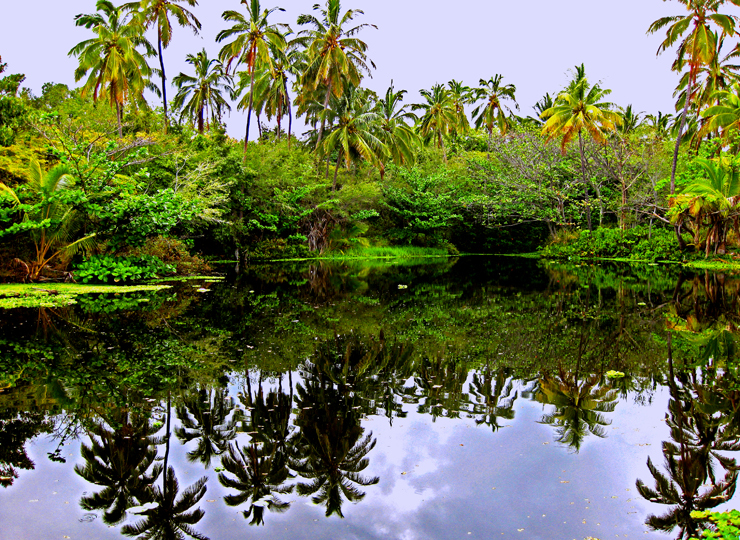 The wildness of the ocean and the serenity of the freshwater fishpond and coconut palm-shaded beaches make this an ideal place to spend some soul-recharge time. 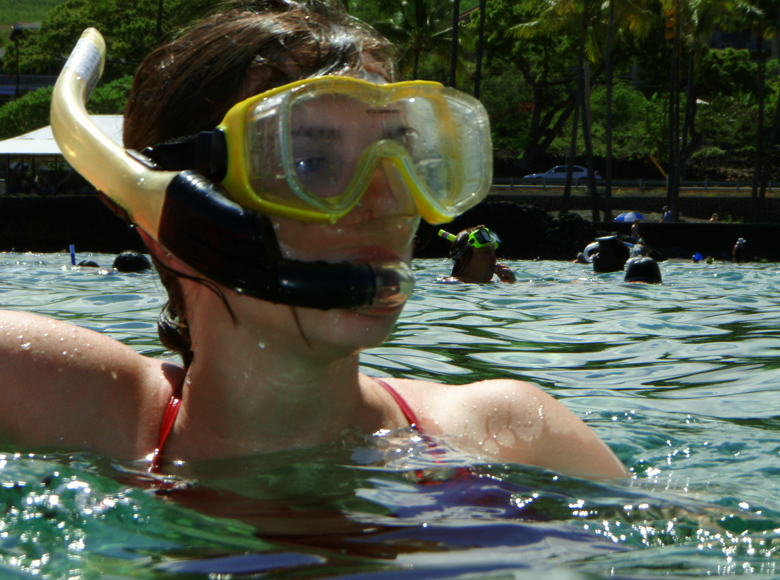 Snorkeling, picnicking and camping, or just relaxing on the beach, are major destination pass-times here. 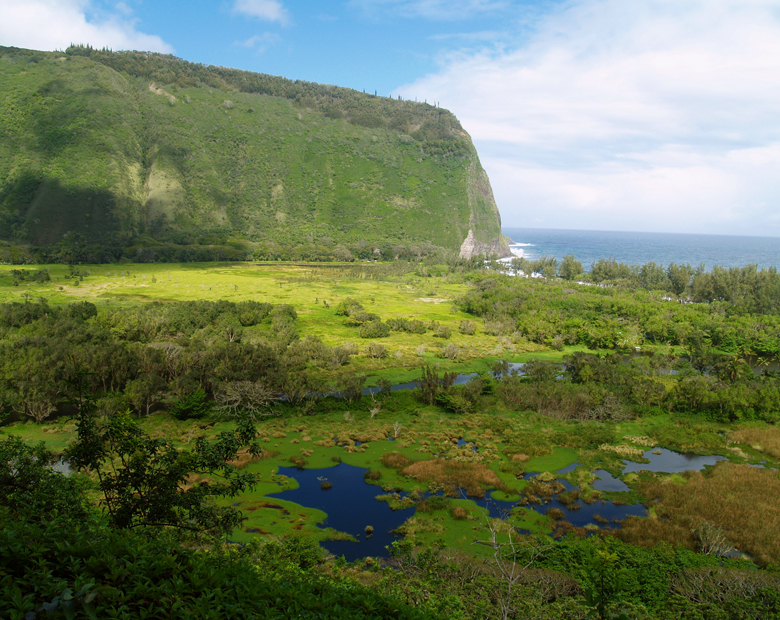 Near South Point and between the villages of Na’alehu and Pahala, Punalu’u is on Highway 11 between mile markers 55 and 56. Punalu’u means “springs you swim to”; it is the abundance of these fresh water springs just offshore that makes swimming at Punalu’u so cold and this settlement site so important to the ancient Hawai’ians. 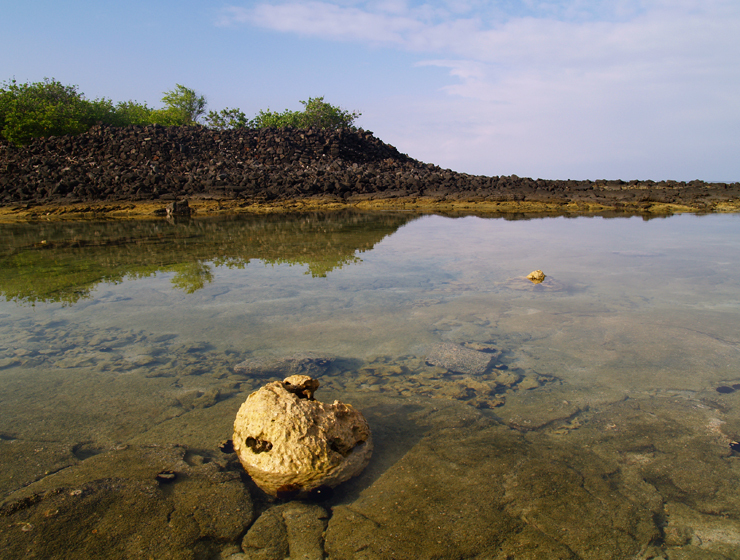 In pre-contact times, due to the scarcity of fresh water along the Ka’u coast, Hawaiians would swim out into Kuhua Bay with stoppered gourds, dive down on top the springs, unstopper the gourds and, by upending them underwater, fill them with the fresh spring water emanating from the floor of the bay. 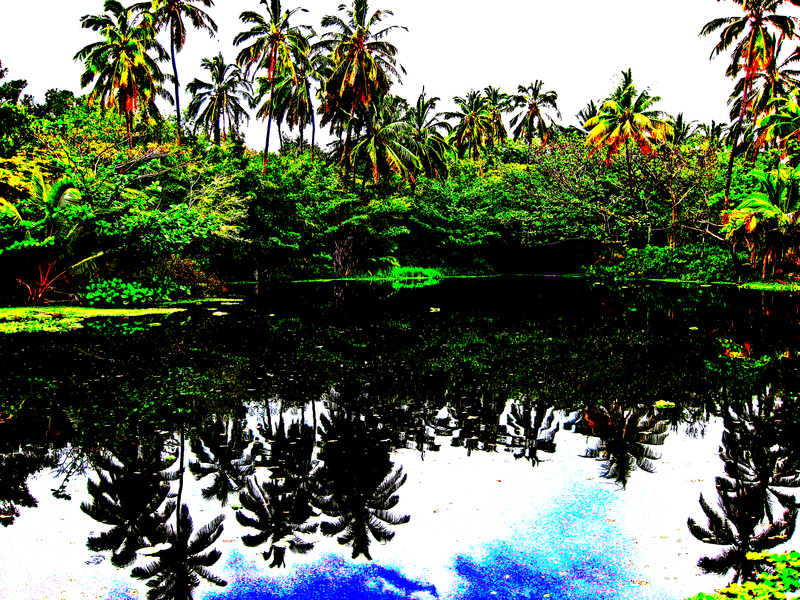 These springs are one of the very few sources of fresh water on this entire end of the island. Dozens of Hawaiian Green Sea Turtles make the waters and beaches around Punalu’u their home; it is one of the few places outside the French Frigate Shoals in the NW Hawaiian Islands where they breed and lay eggs. 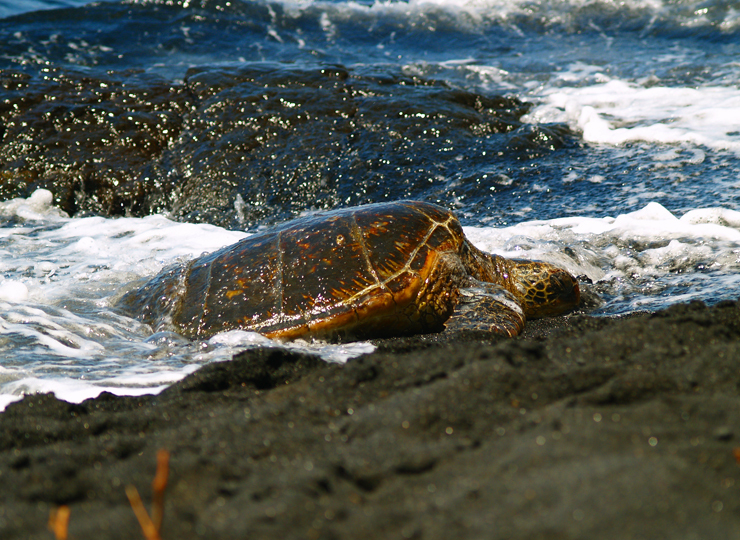 Called Honu by Hawaii’s natives, they are beautiful, serene and seeming wise. Though they have swum the oceans for over 200 million years, peacefully feeding on algae and invertebrates, this highly successful product of amphibian evolution is in grave danger. Loss of habitat, hunting and molestation by humans has conspired to push them to the very verge of extinction. Protected now by state and federal law, the population of once millions of honu has been decimated to just a few hundred thousand. Although they are making a comeback, Hawaii’s honu are still very much endangered. Do not approach basking turtles closely, never touch or pick them up; stay at least 30 feet from them if they are basking on shore. Harassing turtles carries a stiff fine and in any case, touching the turtle is a good way to get a raging salmonella infection. If honu are swimming near where you are, do not approach or chase them; always swim to the side of them, never above (as a predatory shark would) nor below them (so they won’t feel that their soft belly is at risk). Anyone who observes their beauty and grace underwater easily understands why the Hawai’ians base their word for “peace”, “honua”, on their name for the green sea turtle, “honu”. 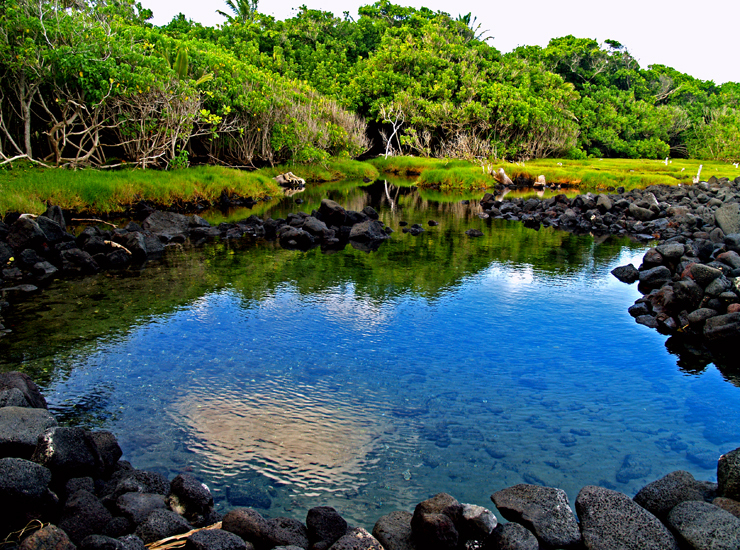 The large brackish pond behind the beach, once a very productive fish-growing pond, is also fed by a large spring called Kawaihu O Kauila (literally, “the overflowing waters of the Turtle Goddess, Kauila). 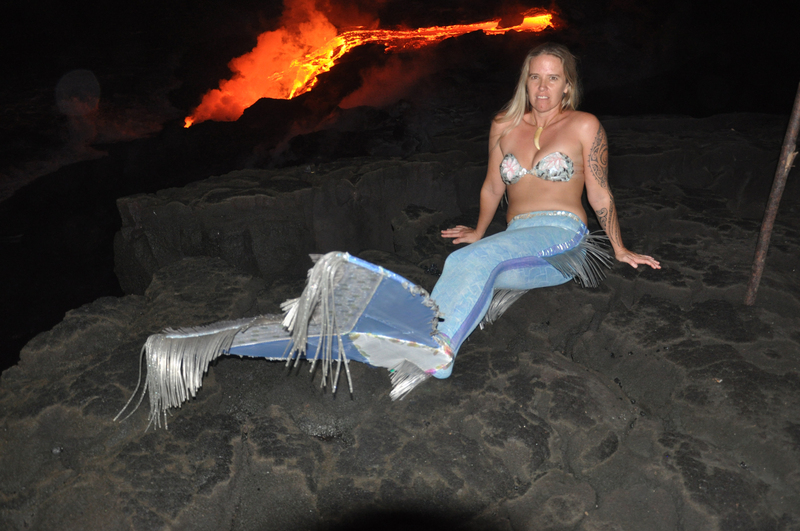 This spring is also where the mythical figure Laka slew the fierce, man-eating mo’o (sea serpent) Kaikapu (“forbidden water”). There are some very, very mixed breed ducks that make this pond their home. On the hill just south of the beach behind the pier is Kaneele’ele Heiau, which also is called Mailekini Heiau. This temple very worth visiting but is often overlooked and not noticed by causal visitors simply because of its extreme size. 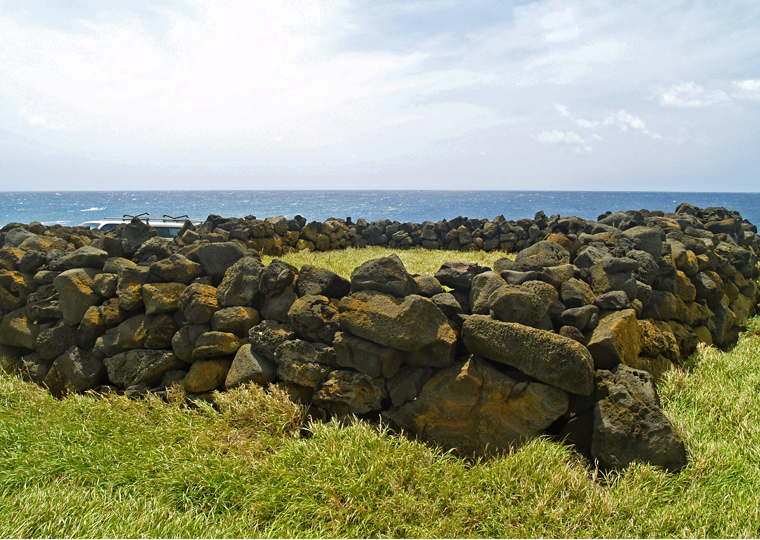 The heiau, standing on the hill overlooking the ruins of the pier and warehouse, is comprised of a stone platform no less than seven hundred feet long and five hundred feet wide. The name, meaning “darkness of the father god”, coupled with the heiau’s massive size, lends credence to the local legend that this was once the luakini heiau, or place of human sacrifice, of some importance for this district. A large sacrificial stone (now removed) outside the entrance, and bone pits discovered on the temple grounds during construction of the pier and warehouse, point to this as well. 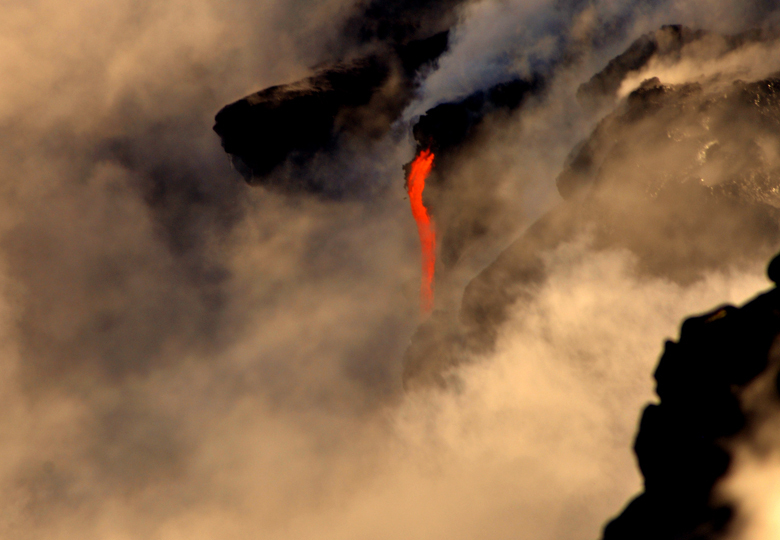 Kaneele’ele is thought to represent two heiaus constructed end-to-end; Punalu’u Nui in the north and Halelau in the south. 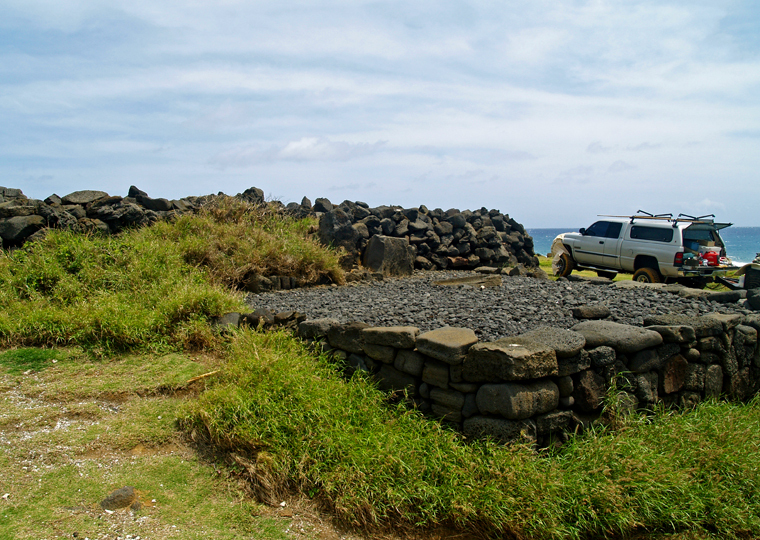 West of the parking lot, above Ninole Cove, stand tumbled walls, all that remains of Ka’ie’ie Heiau. 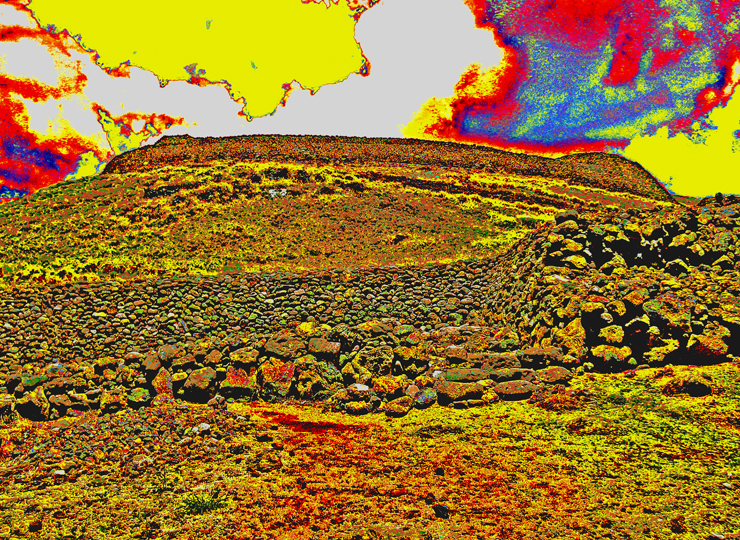 Bordering the a’a lava flow, this temple once presided over a large fishpond that was destroyed by the a’a flow. Other ruins in the park include the historic ruins of the Pahala Sugar Company Wharf and Warehouse, alongside Kuhua Bay. After the Japanese bombed Pearl Harbor at the outset of World War Two, the Army destroyed the wall and pier facilities so the Japanese couldn’t use them to land on Hawai’i’s unprotected southern side. 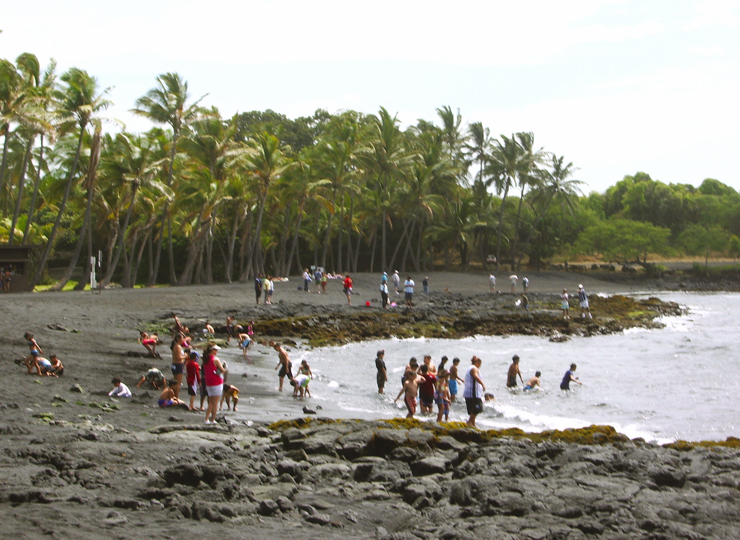 The beaches and land immediately adjacent to Punalu’u Harbor, Ninole Cove and Kuhua Bay are all part of the County Beach Park. Snorkeling at Punalu’u is cold due to the number of off-shore springs and a bit weird (the black sand bottom makes the water dark even on the brightest days), but very rewarding, considering the density of sea turtles in the bay. Strong off-shore winds, ocean currents and a fearsome rip mean swimmers and snorkelers should use caution and stay near shore when swimming at Punalu’u, but it’s hard to resist getting in with all those turtles. Camping is permitted around the pavilions and is by permit only. Pitching camp here can be a windy, but wild and elemental, exercise in campcraft. Due to the exposed nature of the terrain, however, there is little privacy. Available services include water, picnic tables, restrooms, electrical outlets, and pavilions, parking; camping by permit only. During peak tourist time, there is a souvenir stand with some packaged food items and canned drinks for sale. 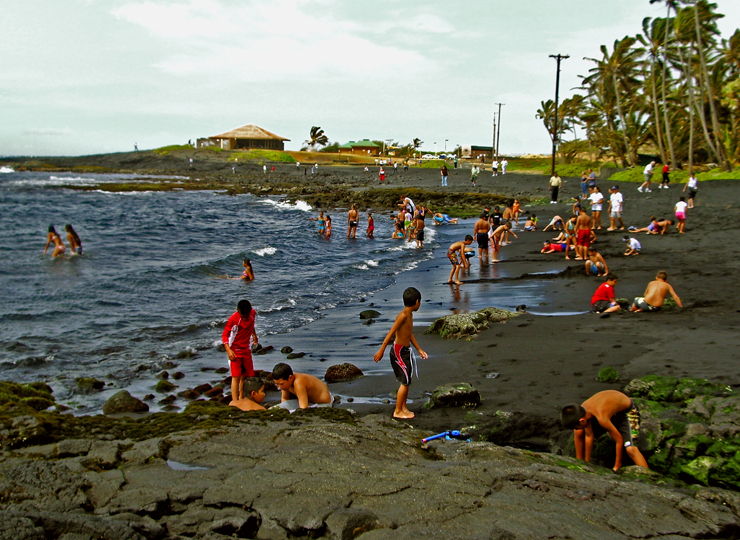 Our Big Island is geologically quite young and the landscape is immature, so our beaches tend to be smaller than those on the older islands, and are therefore all the more precious. 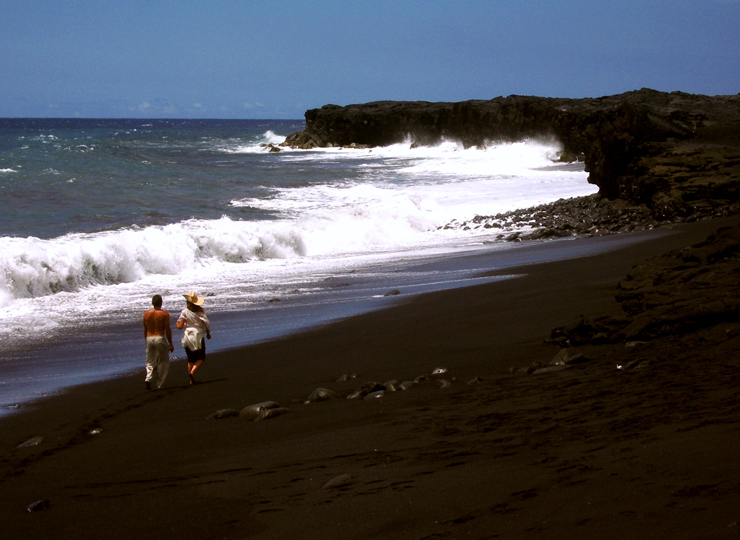 What the Big Island has that some of the other islands lack, though, are beaches with spectacularly colored sand…white sand, black sand, green sand and even grey sand. 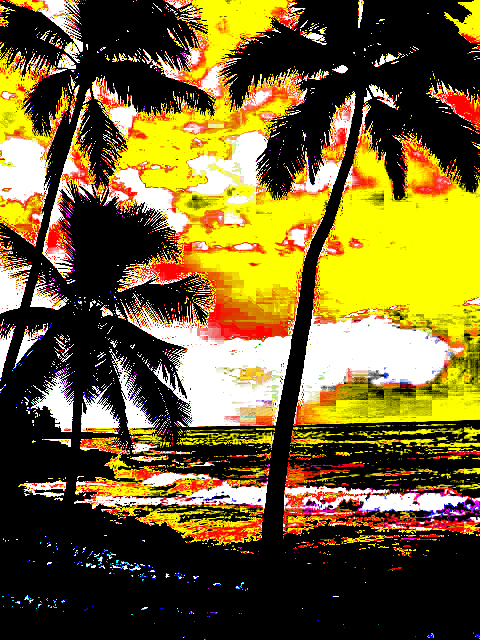 The creamy white sand beaches of picture postcards and hapa haole songs result from the accumulation of small particles of coral reef and crushed shell fish shells. As the reefs grow, wave and storm action break it into small pieces and many fish, such as the parrot fish and the humuhumunukunukuapua’a munch the coral, spitting-out sand sized particles, and the coral they swallow comes out…er…the other end as sand-size pellets of sandy waste. In this way, one coral-eating reef fish can produce up to a ton of white sand a year. Because our white sand beaches result from physical degradation of soft, biological material, the sand grains tend to have rounded edges. 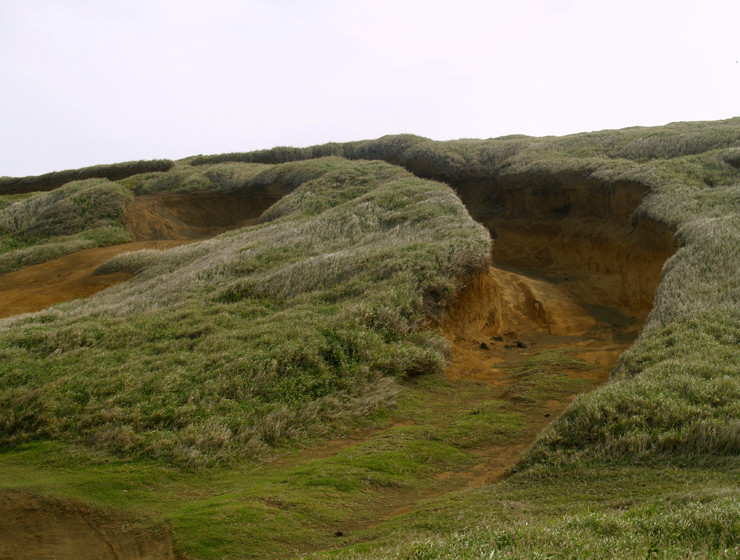 Thus, unlike sands derived from rock and mineral sources, such as the California beaches, they do not stack well and tend to produce poor sand castles. 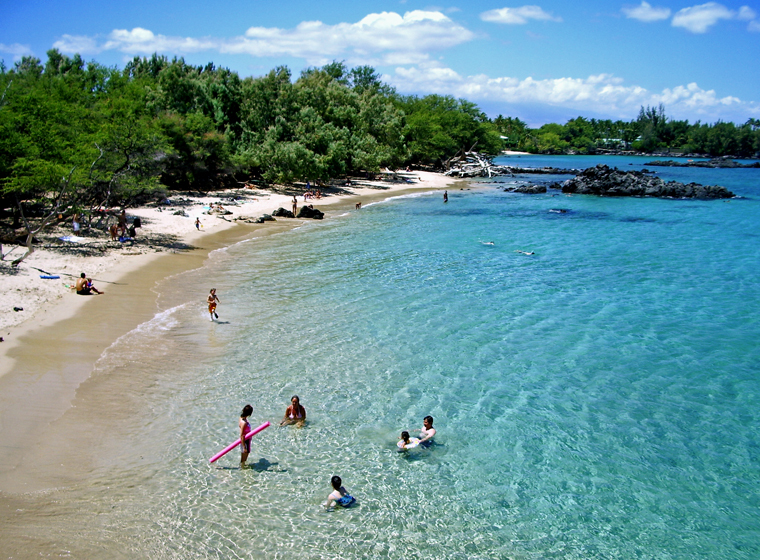 Beautiful white sand beaches occur all over the Big Island, but are biggest and best developed on the Kona and Kohala coastlines, as coral reefs prosper best on the lee-side of the island. 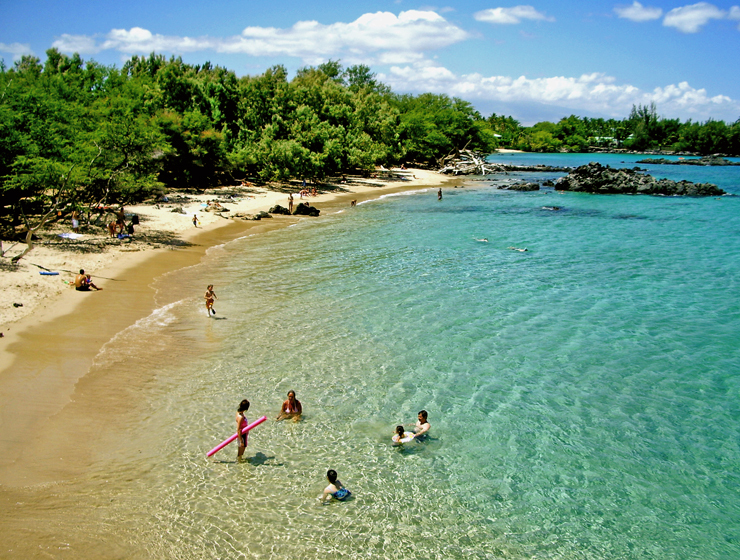 Prime examples of white sand beaches include Anaeho’omalu, Hapuna, Waialea and Makalawena Beaches. Snorkeling at these white sand beaches is a joy—the water is a brilliant turquoise due to the amount of light reflected back into the water by the sandy shore bottom. However, this sandy bottom itself is relatively barren of life, so if seeing fish is your main snorkeling goal, be sure to choose a beach with a nearby reef, such as Waialea Beach, since the fish live in and around reefs and rocky cliffs. 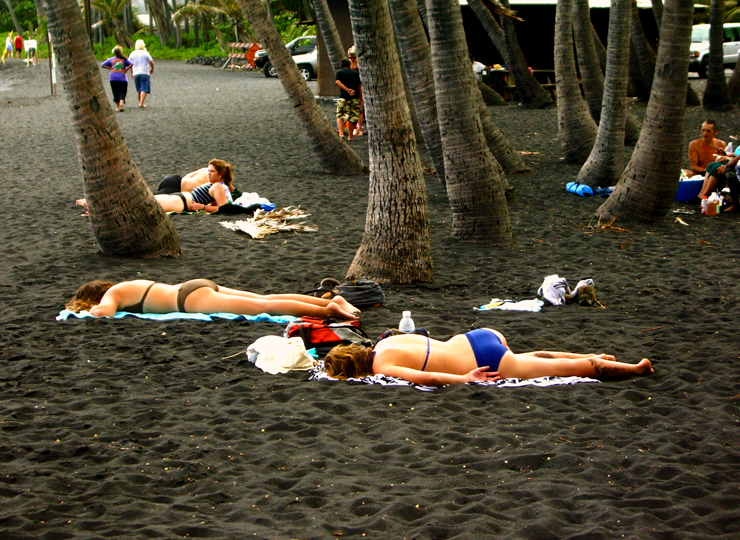 Black sand beaches are strange and spectacular, and, because of their thermal properties, are warm even on a chilly day (Oh, yes, we do have chilly days here in Hawaii–in mid-winter temperatures can dip into the low 70s and even rarely the upper 60s!). 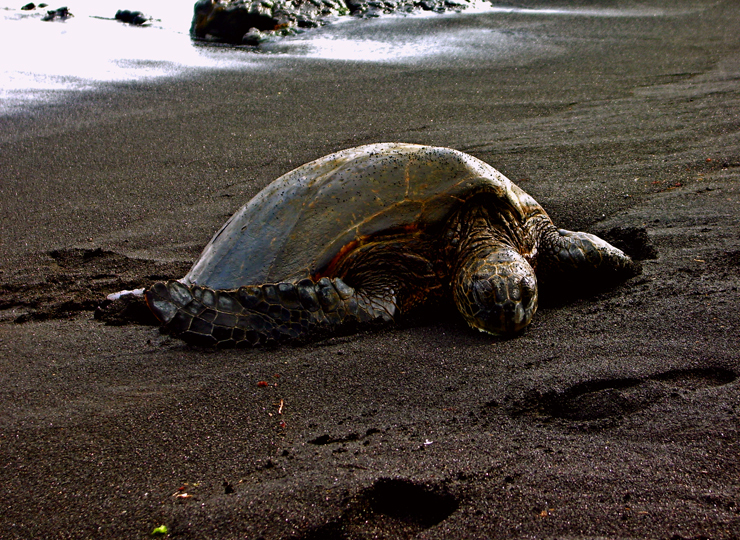 In fact, it is the black sand beaches of the Big Island that are the choice among egg-laying female Hawaiian green sea turtles for laying their egg clutches on, precisely because of their warmth. 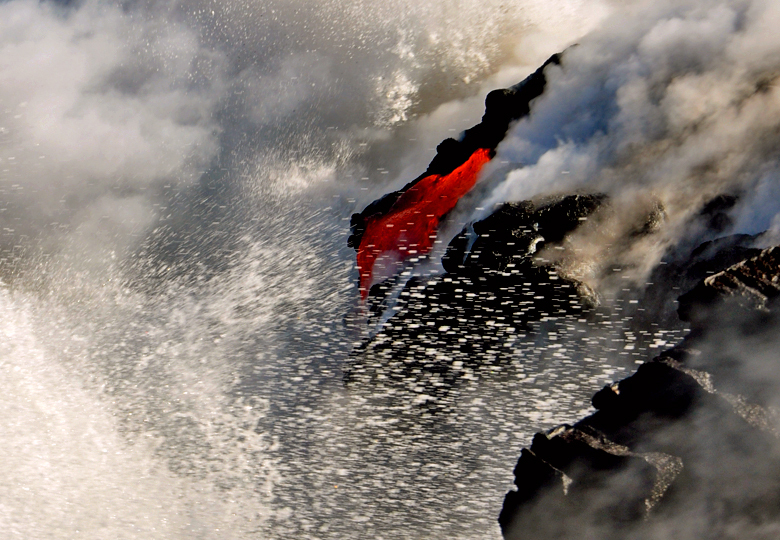 Black sand beaches result from the fiery, explosive mix of hot liquid lava entering the ocean. 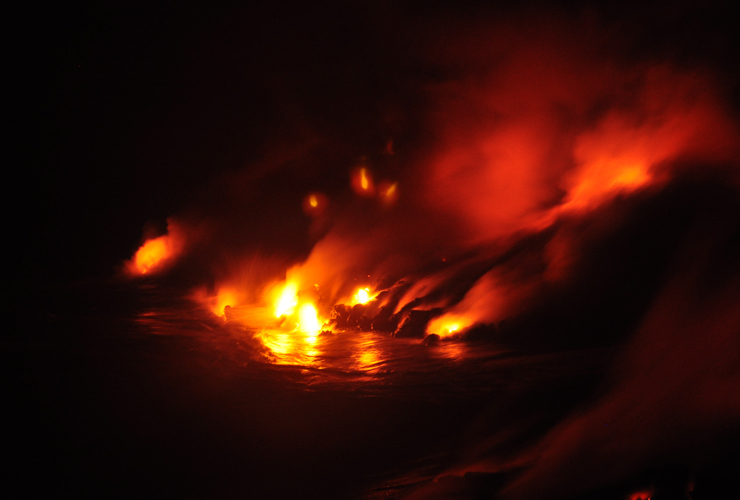 The skin of the lava stream is instantly chilled as it flows into the water and then blasted off when the ocean water flashes to steam. 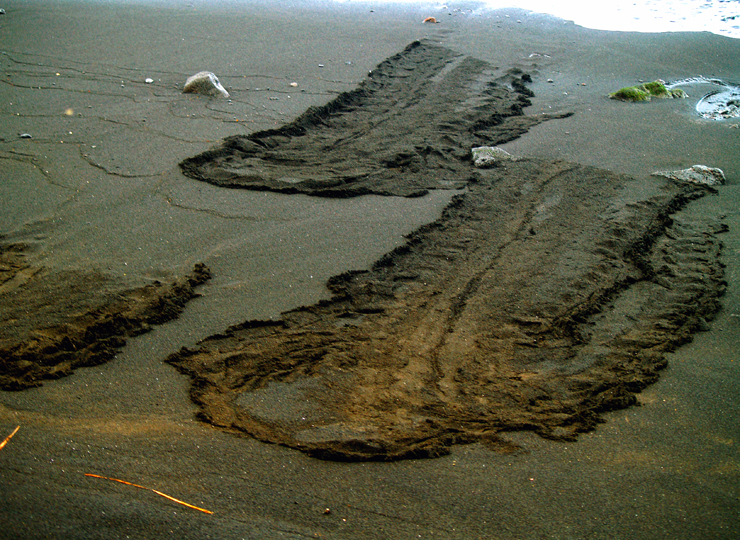 Black sand also results from mechanical action during the natural physical erosion of the basalt (the name for the rock our lava becomes once it cools). 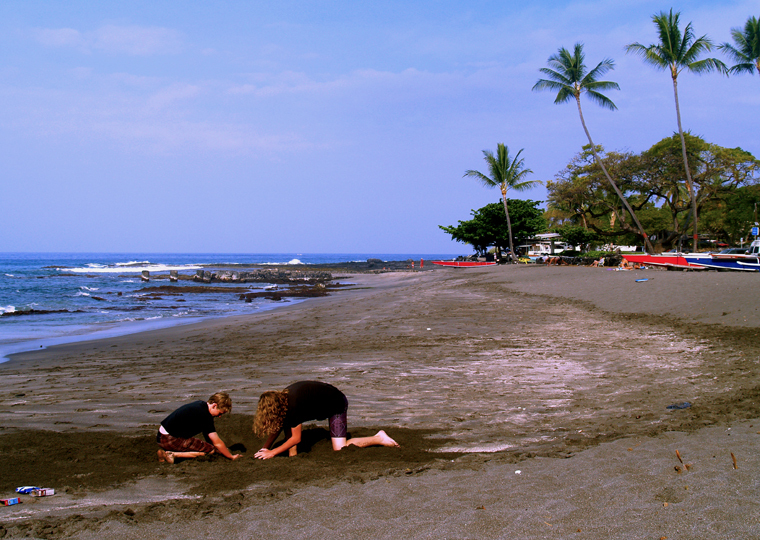 You’d think that sand forged in the volcano would be tough and enduring, but in truth, it’s very, very fragile and black sand beaches do not last long over time. For this reason, although the sand is beautiful and rare, we ask you not to take any home with you. 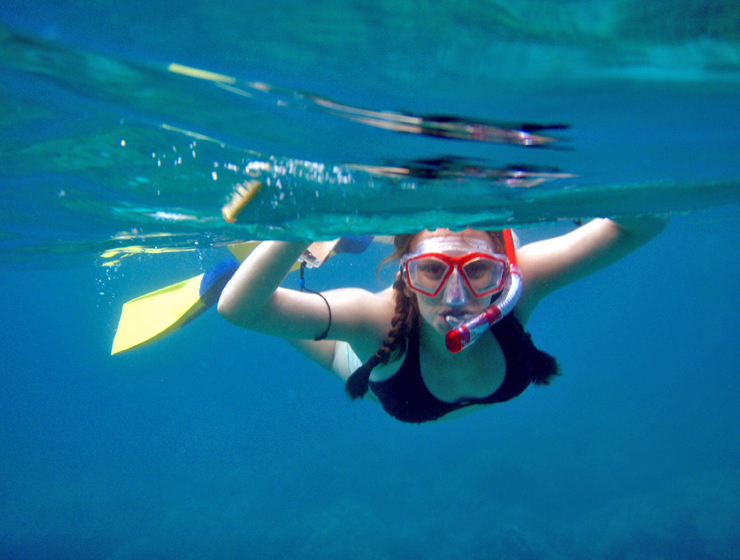 Snorkeling at the black sand beaches can be dark and mysterious, as little light is reflected back into the water from the sandy bottom, but the bouldery nature of the off-beach sea floor assures the prospect of abundant life and many reef fish. 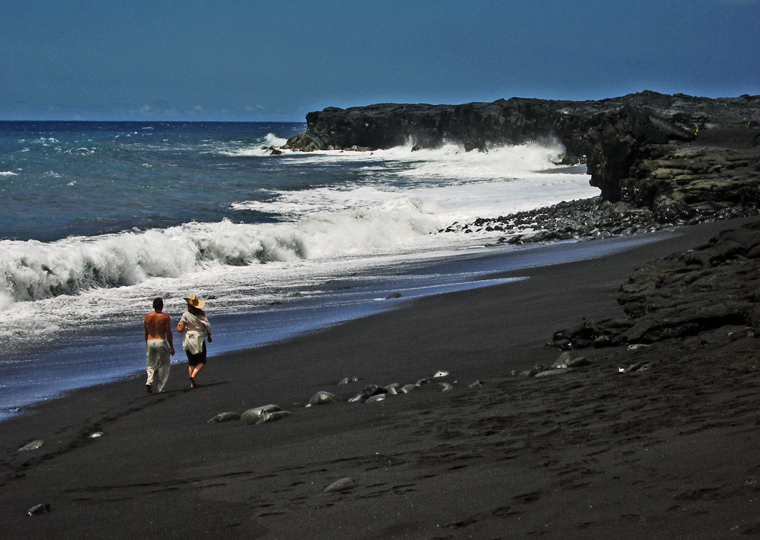 Be aware…because black sand beaches mostly occur on the youngest, and therefore most exposed, portions of our island, many are characterized by big waves, strong currents and nasty rip tides. Swim only where you see others swimming, and only when a life guard is present. 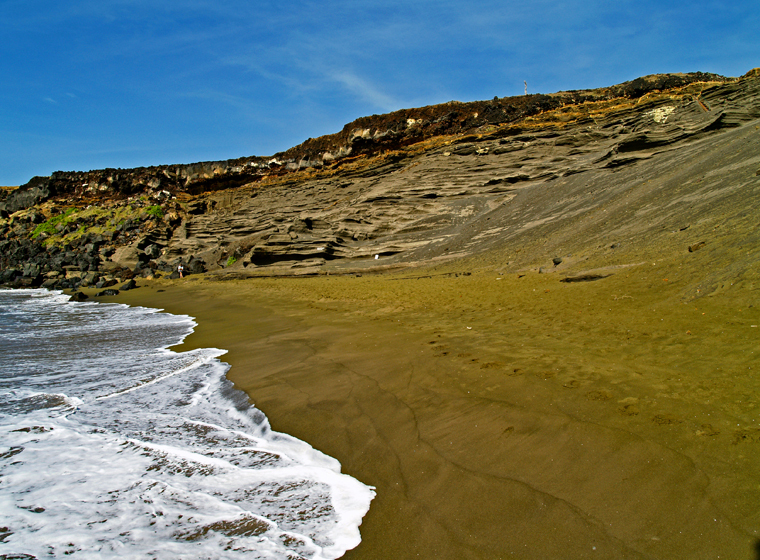 Wild, surreal, enchanting, the Big Island’s green sand beaches are a rare geologic occurrence that appear in only a few choice spots on our island and almost nowhere else in the world. Although they take a little effort to get to, you should not travel all the way to Hawaii and not see these jewel-like beaches. 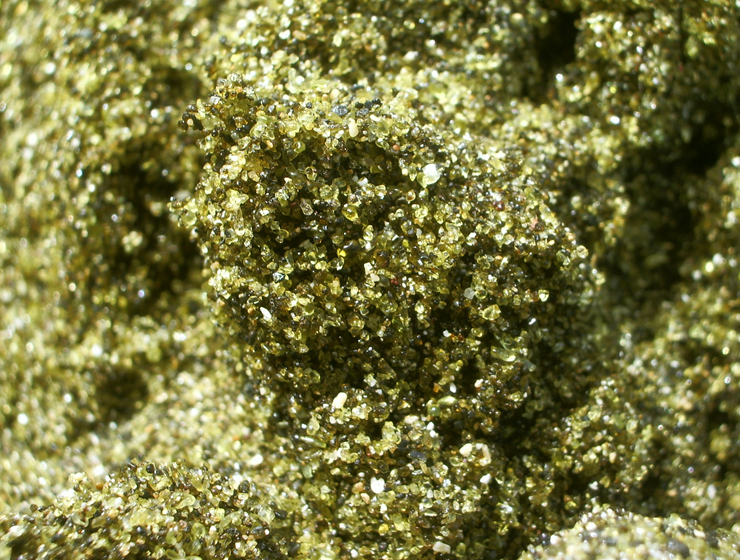 The green sand is composed almost entirely of the mineral olivine, or peridot as the gem quality crystals are known. These crystals precipitate out of the molten lava while it sits in the magma chamber reservoir before it erupts onto the surface. 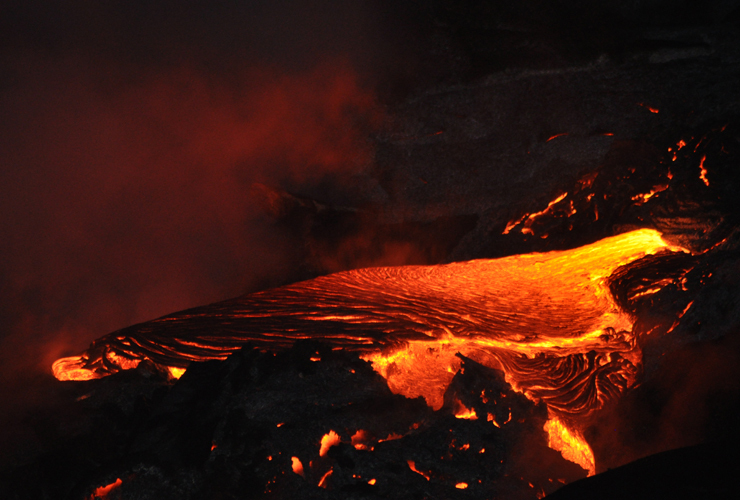 The liquid lava is melted from rocks at great depth within the earth; the chemical composition of the melt is at equilibrium at extremely high pressures and temperatures. 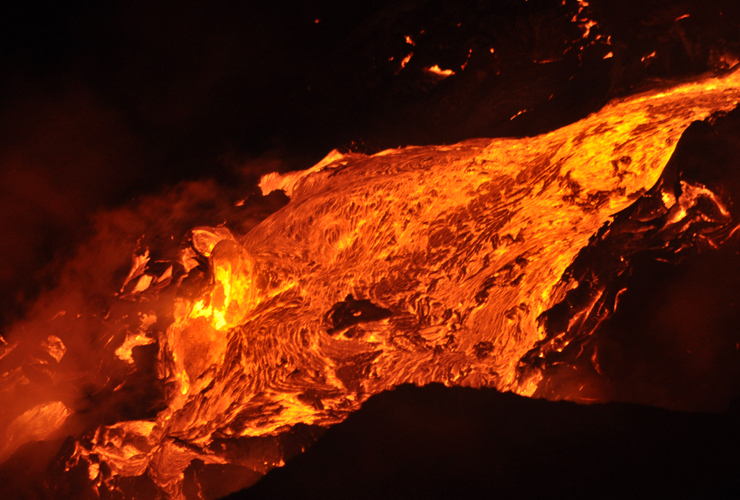 As the magma migrates upward, many miles, through the Earth’s crust, it cools and pressure decreases; this causes crystals to precipitate from the melt. In magmas world wide, olivine is almost always observed to precipitate out first. 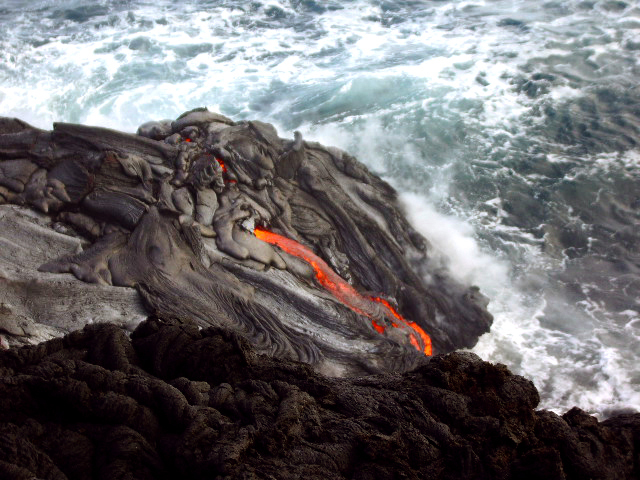 In Hawaii, lavas migrate up to the surface so quickly, and then are expelled from the magma chamber onto the surface so quickly, that usually they have little time for many crystals to form. But when lava does sit in the magma chamber awhile, the olivine crystals do precipitate, and they slowly settle to the bottom of the melt. 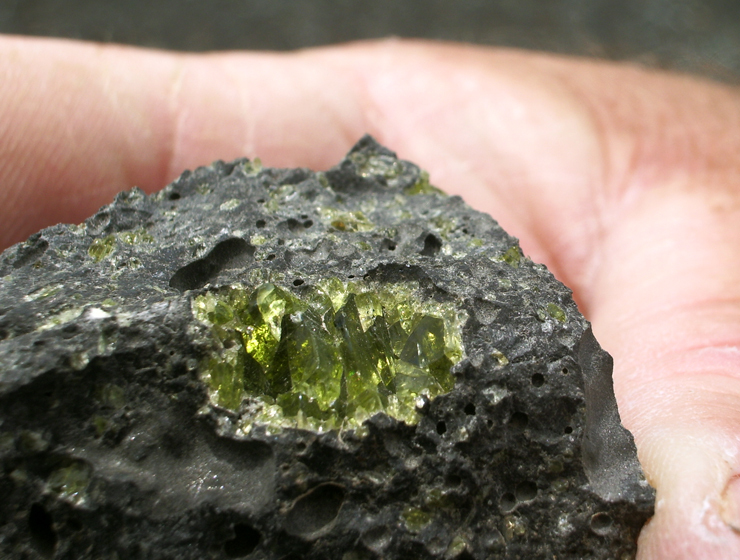 As liquid lava begins to erupt onto the surface, much of the olivine is left behind in the residual liquid. 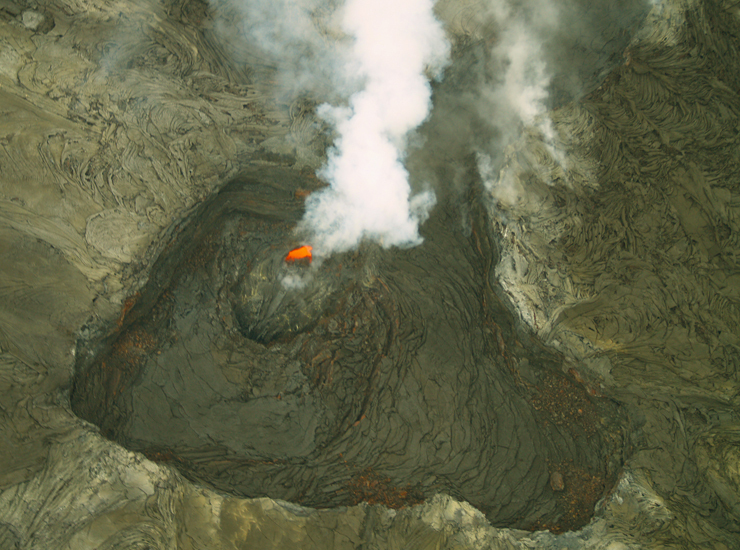 Thus, lavas erupted from the latest stages of these magma chambers sometimes are enriched with crystalline olivine. 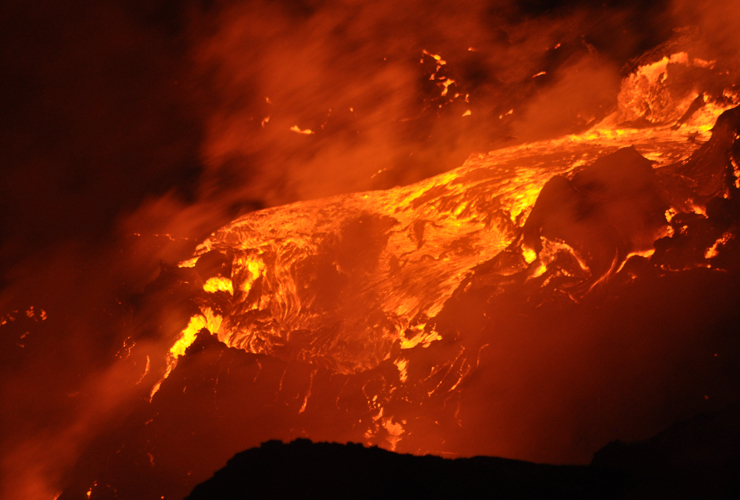 Since late stage magmas are also relatively cooler and less fluid, their eruptions are more explosive and they tend to form more spatter cones than flows. 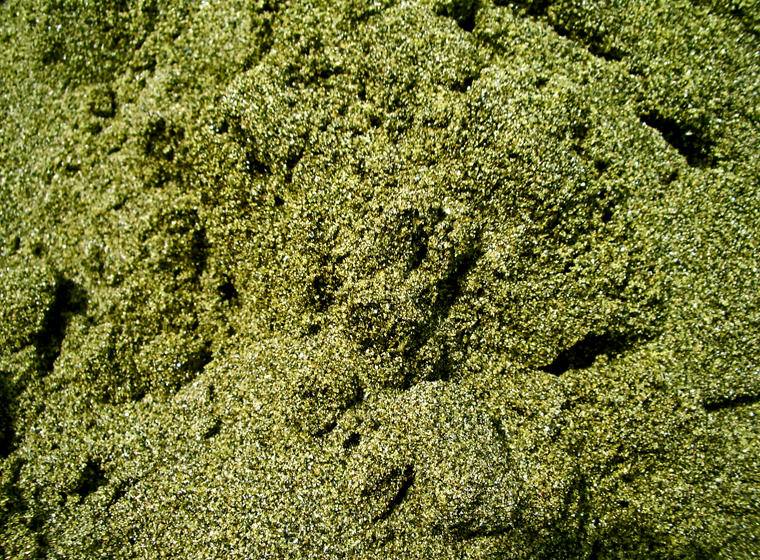 The green sand beaches of the Big Island result where the ocean has breached one or another of these spatter cones, and the winnowing action of the waves has washed away all the particles except for the relatively denser olivine grains. 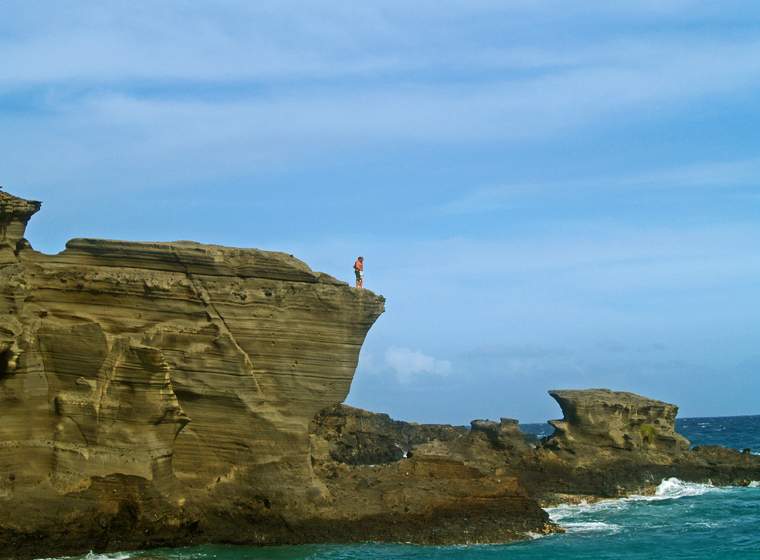 There are tiny green sand beaches all along the southern coastline on either side of South Point, but the largest and most accessible is Mahana Beach on Papakolea Bay at South Point, reached by a moderate hike of about 2 ¼ miles along the wild coastline northeast of South Point, following an old 4WD two-track. 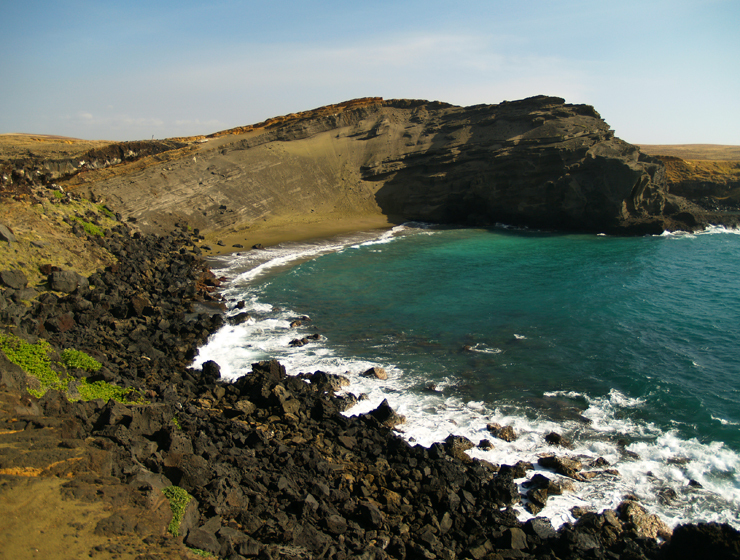 Because of the unique sand color, snorkeling at the Green Sand Beach is a must…underwater pictures, if you are equipped with a suitable underwater camera, are quite stunning. 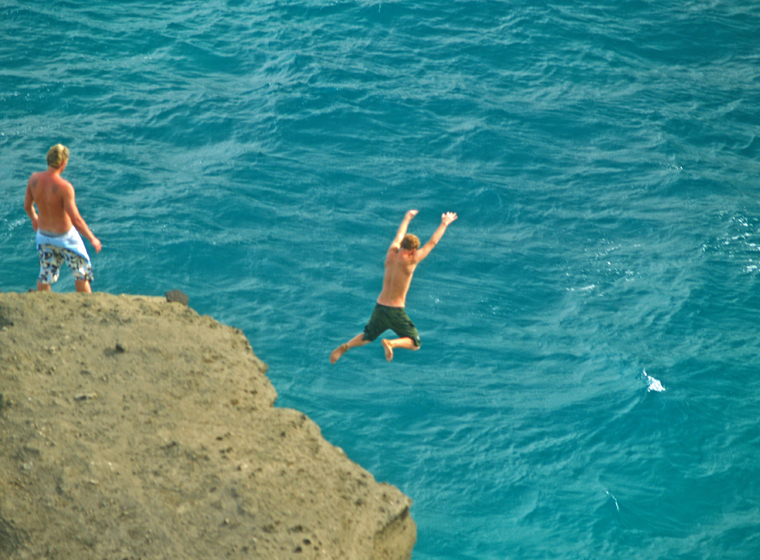 Just be careful of the treacherous currents, rip tides and big waves. 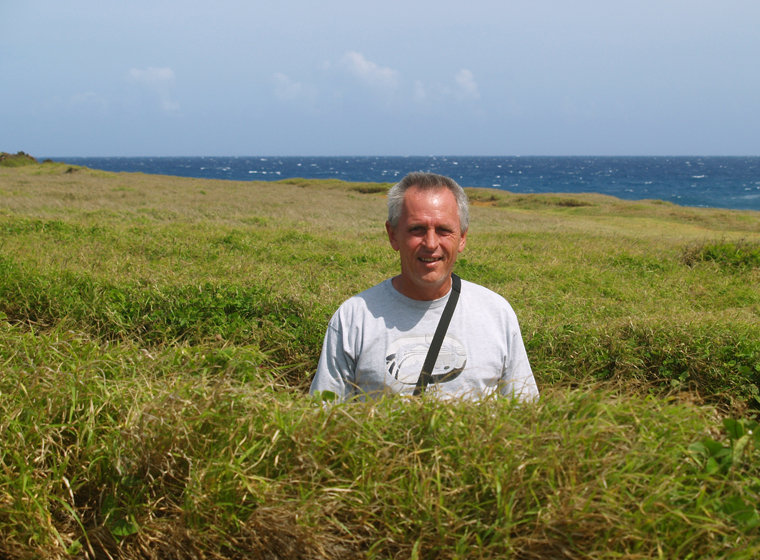 This is the wild and open ocean and this side of the island is completely unprotected. 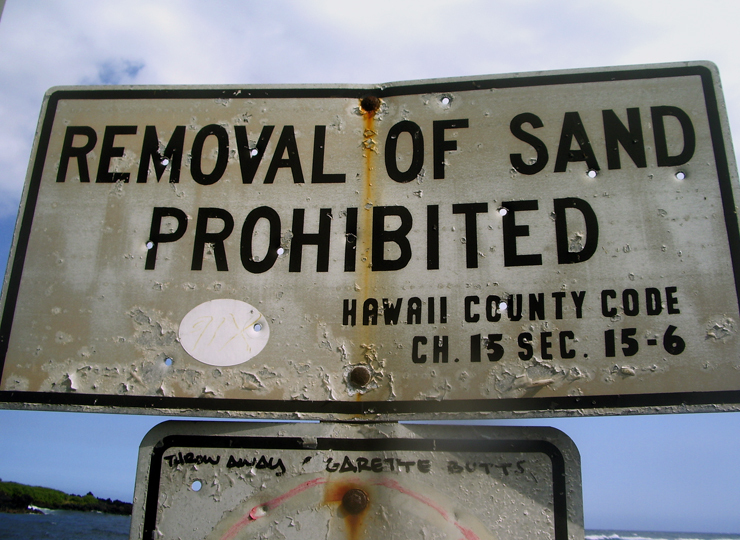 Once again, due to its rarity and the irreplaceable nature of this resource, we ask that you enjoy our Green Sand beaches, but don’t take any sand home with you. Warm, comfortable and inviting, grey sand beaches result from mixing of black sand particles with white sand along a stretch of beach and as such, are represented by a continuum of grey hues. 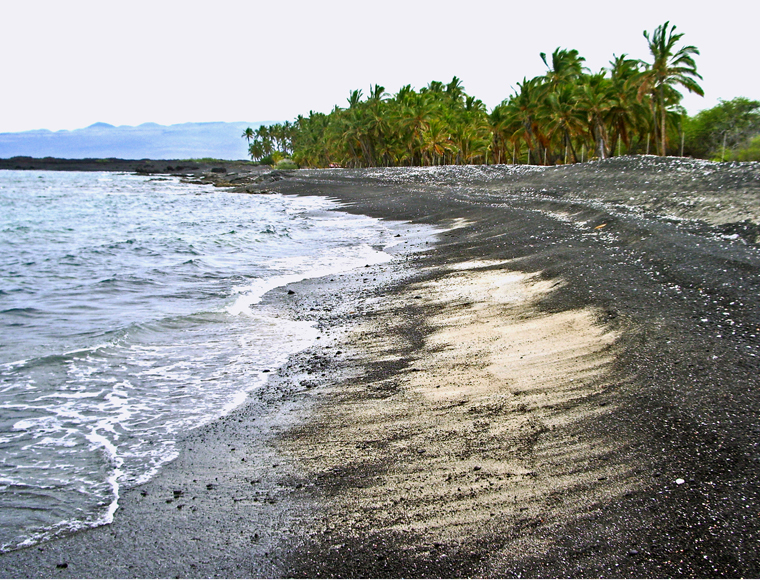 In fact, many Big Island beaches probably fit more with a definition of grey sand beach than properly occupy either of the two distinct end member compositions, black sand or white sand beach. Ho’okena, Kahalu’u and Honomalino are three of the largest and most popular grey sand beaches on the Big Island. 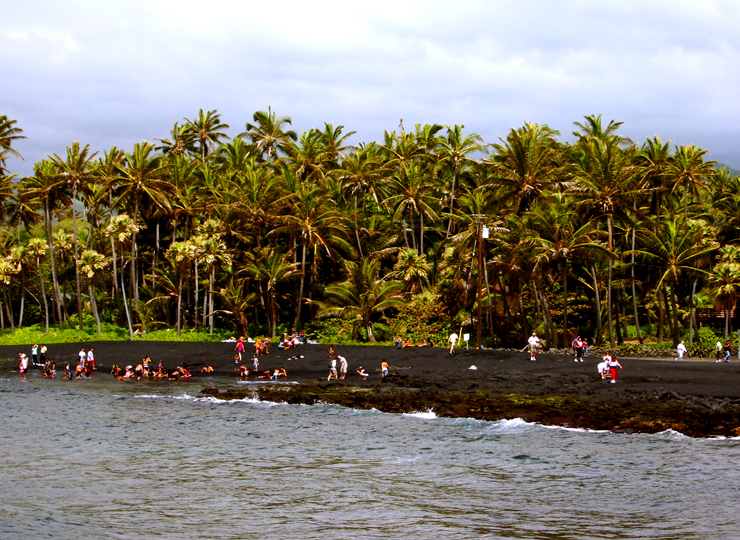 There is one entirely unique beach, Ke-awa-iki, which today is a dominantly black sand beach, but the black sand has incompletely mixed with the older white sand on the southern portion of the beach, leaving a stretch of strange, but oddly artistic, piebald black and white sand. 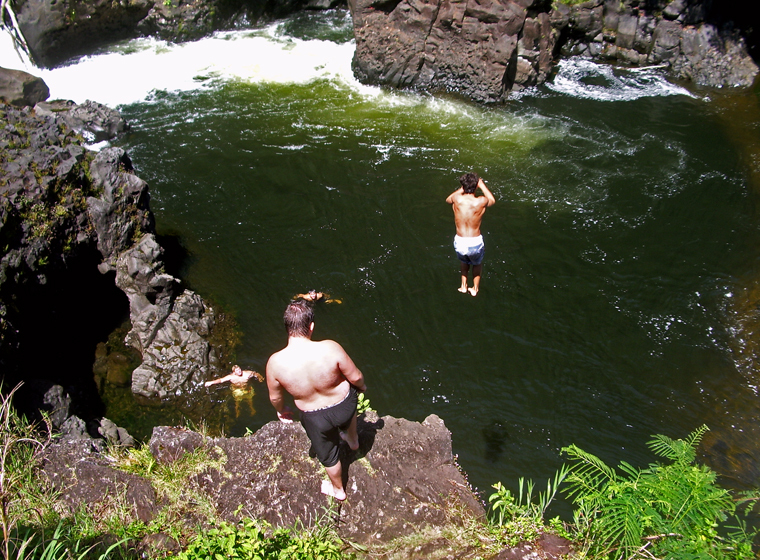 There are many places on the Big Island of Hawaii that have undeserved infamous or unsavory reputations for one reason or another–the reputations of the road to South Point and Saddle Road come immediately to mind. 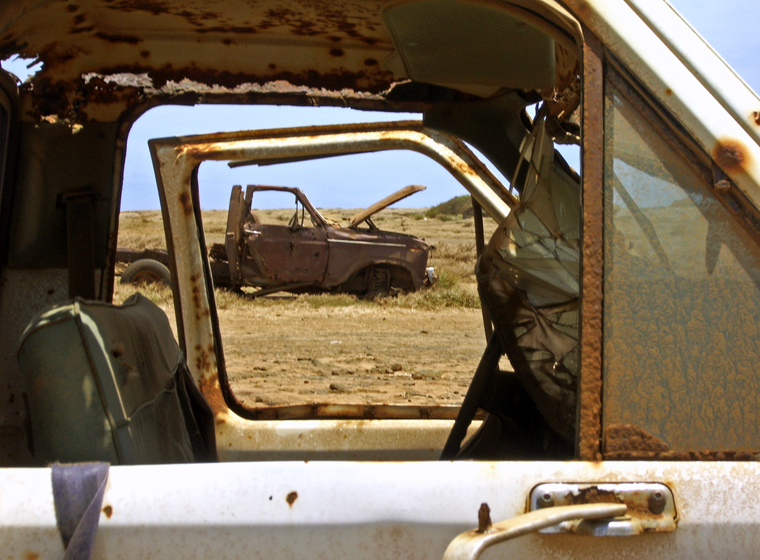 Once difficult, even dangerous, to drive, they have been more or less tame for decades–yet the reputation remains, passed on to unsuspecting visitor’s who trust what they are told. 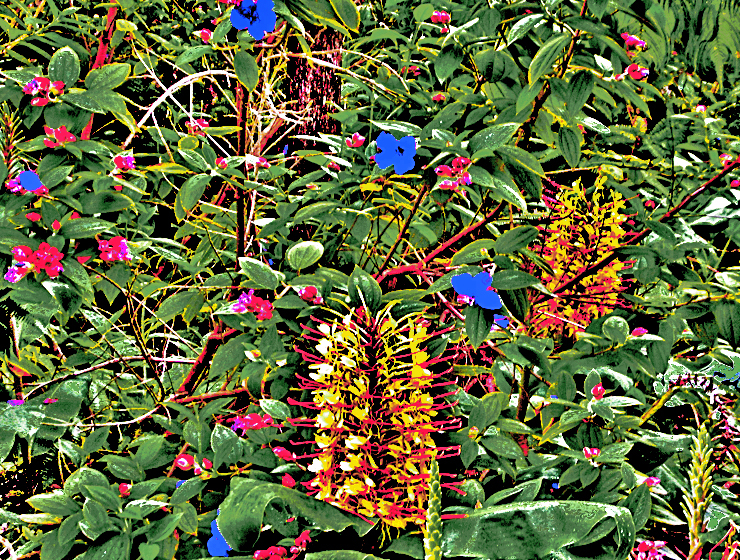 Recognition of this must be balanced with the sure and certain knowledge that in the same breath they condemn the South Point road, someone may tell the same visitor of the hazards of, say, the road to the summit of Mauna Kea or The Road To The Sea in South Kona–both of which can be truly dangerous roads requiring skill, good weather and four-wheel drive to negotiate. 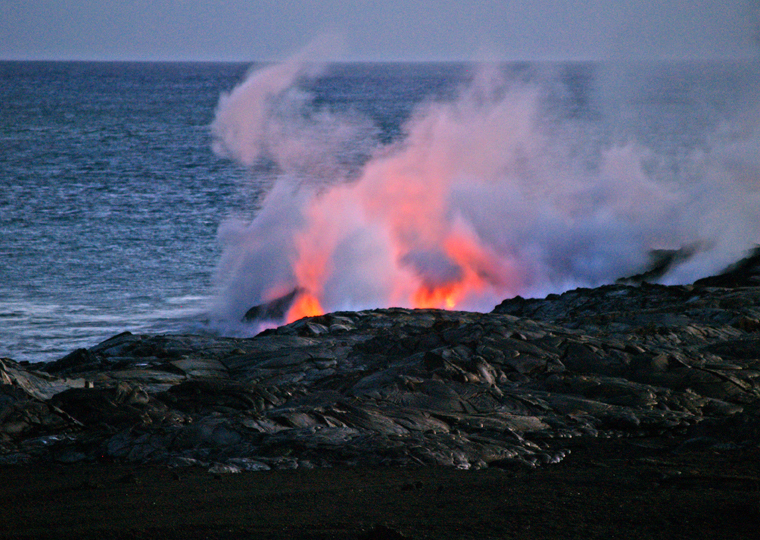 We here at Tour Guide have endeavored to collect and present the most up-to-date information on visiting over 500 locations on the Big Island, coloring the material with our decades of personal experience living on the Big Island. Today, you may access that information here on this blog or by renting our GPS unit which shows location aware video presentations about all these sites. Recently, we have released a version of our tours downloadable to iPhone and iPod Touch that covers more than 50 areas of island, highlighting the popular and the uncrowded, the famous and the secluded, the adventurous and and the relaxing. 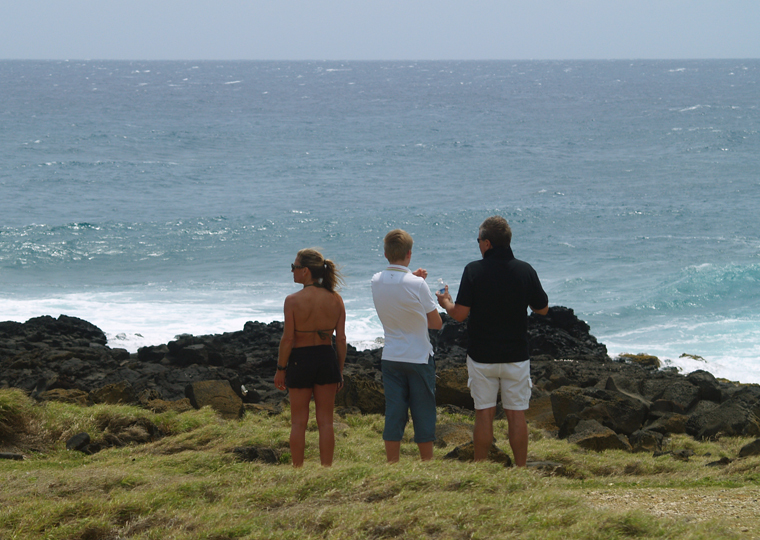 So, let’s talk about going to storied South Point on the Big Island which, despite what you may hear to the contrary, is a delightful drive and an amazing place to explore. Haunting, windswept, wild, empty, beautiful. 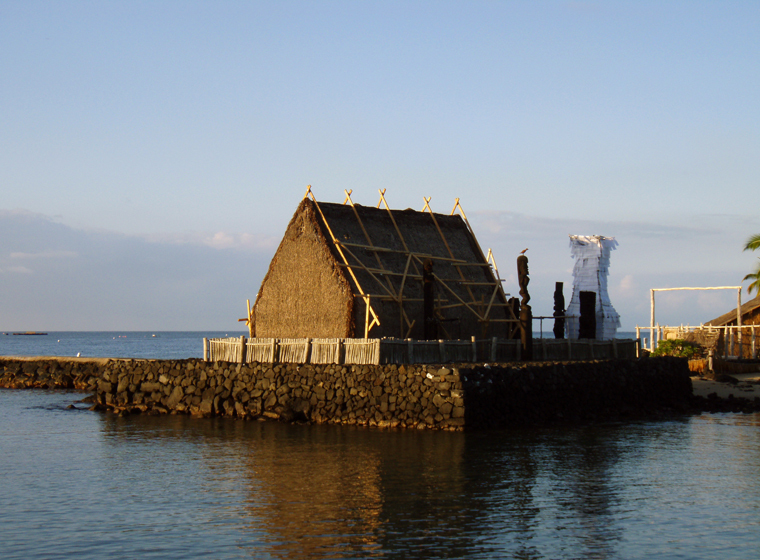 Imagine the gratitude and wonder of the first Polynesians who, after voyaging at sea without sight of land for more than a month, finally made land here at Ka Lae. 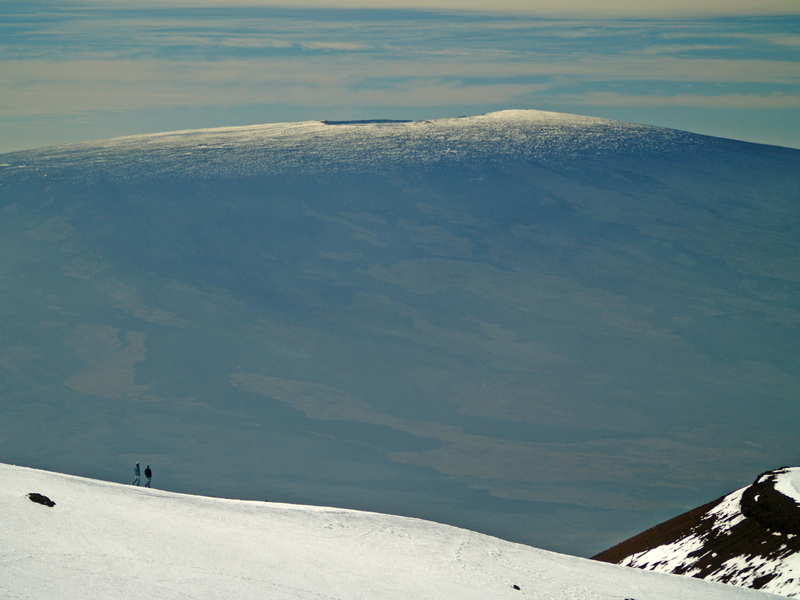 This sweeping landscape arches openly and inviting from the tumultuous shore break at Ka Lae to the icy heights of Mauna Kea’s summit almost 14,000 feet above. 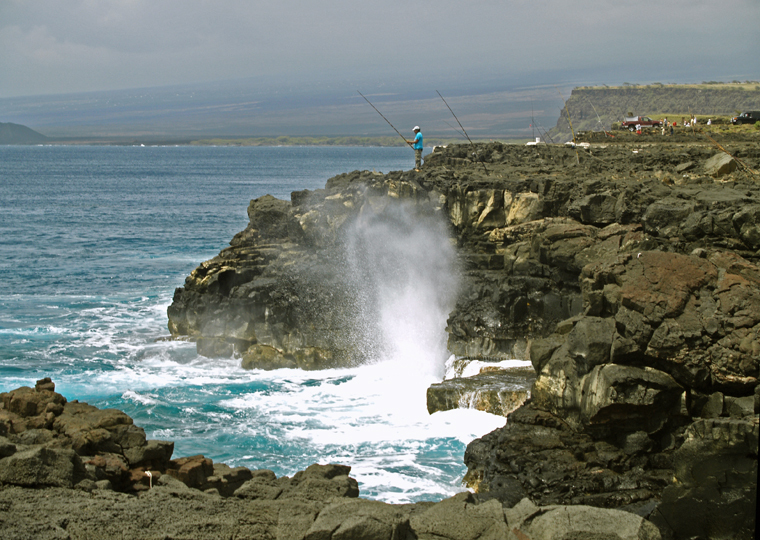 South Point is the farthest point south in the entire United States…not Key West Florida, as some guidebooks claim. The road to Ka Lae from the Hawai’i Belt Road is infamous, but has been greatly improved in recent years, although it’s still only 1-lane wide in many places. Even today some rental agencies admonish you not to take their cars down this road. Relax. The road is fine, although blind turns and hills command your attention and should curb your desire to speed. Also, all the roads, beaches, boat launching facilities and parking are free and public, despite what some signs and unsavory characters might try to tell you. Just don’t leave valuables in your car, and be sure to lock it up (there also is no “Visitor’s Center”, contrary to the sign). 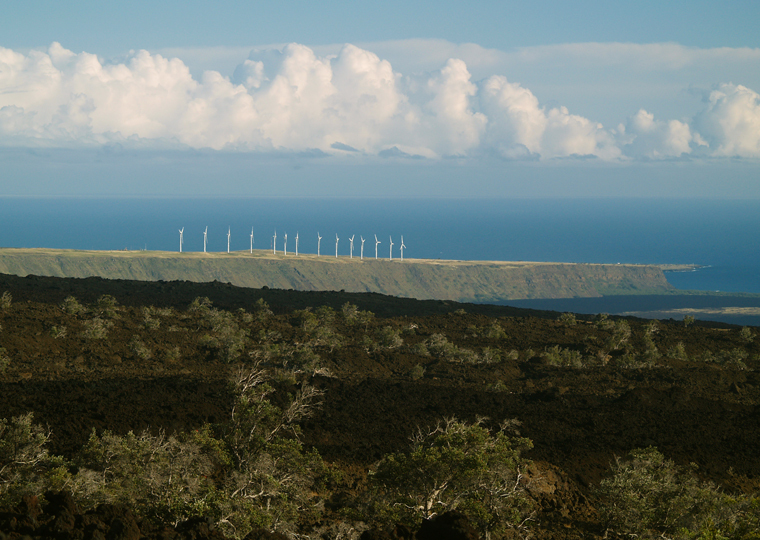 Along the road to Ka Lae are the brooding and dilapidated wind turbines of the Kamaoa Wind Farm. 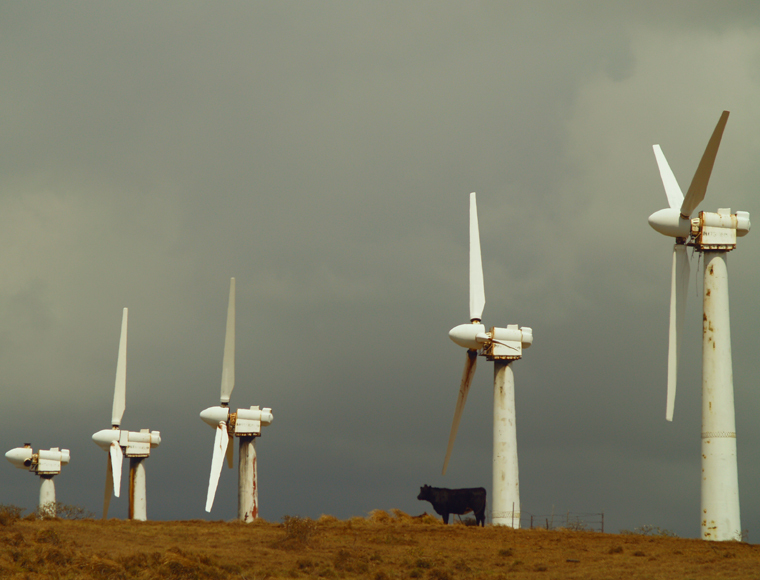 This wind farm, when all of the turbines are operating, can generate enough electricity to power 100 homes; unfortunately, usually 1/3 to ½ of the turbines are out of service at any given time. The surreal setting on the green plain with the cows grazing unconcernedly, coupled with the eerie, “sci-fi” sound of the generators makes this a unique place to stop, look and listen. At South Point proper are a number of dilapidated structures and foundation ruins. The Army had a barracks here during World War II; the paved road was built in 1955; during the sixties, the Navy built a missile tracking station which the Air Force later took over and renamed South Point Air Force Station, which closed in 1978. 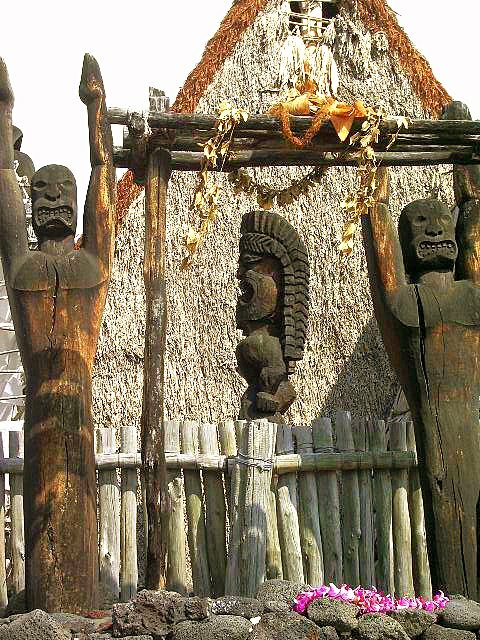 History: The Polynesian pioneers who first reached South Point routinely made incredible voyages that put European seafaring and exploration of a millennium later to shame. More than a thousand years before Columbus, in tiny, twin-hulled canoes that were entirely of carved wood lashed together, using no nails or wooden pegs and employing sails made of tree bark, Polynesians embarked on a voyages that were thousands of miles farther than those of Christopher Columbus, and without the aid of a compass or charts with which to navigate. Using the stars, currents, patterns of migration of the birds and fish, patterns in the waves, water temperature and the color of the undersides of clouds, these explorers navigated, explored, sailed and paddled all across the Pacific spreading their culture, language and peoples at the time when the Roman Empire was crumbling and centuries before the Age of Vikings. It is thought that voyagers from the Marquesas first landed on Hawai’i, at South Point, quite early in the fourth Century AD; certainly the earliest archeological artifacts found in the Hawai’ian Islands are found here. 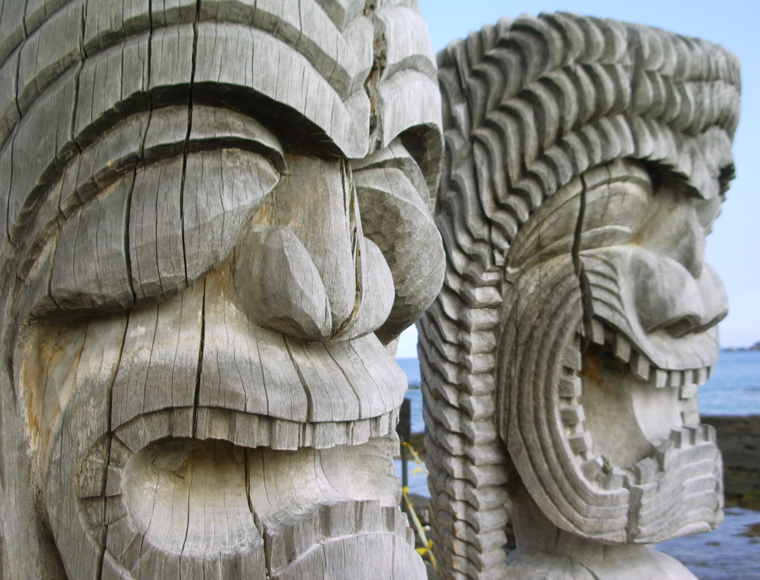 At Ka Lae the Polynesians established a thriving colony based upon the incredibly rich fishing grounds just offshore. The colony was connected to the rest of Polynesia by trade routes to the Southern Islands and regular trade and travel between the Marquesas, Marshals, and Tahiti continued for centuries. 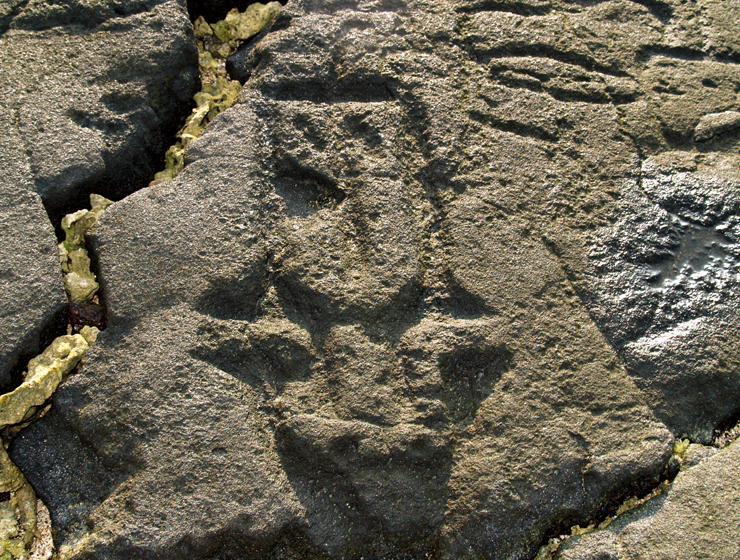 Evidence of their colony can be found at Kalalae Heiau, just below the light tower at the Point. 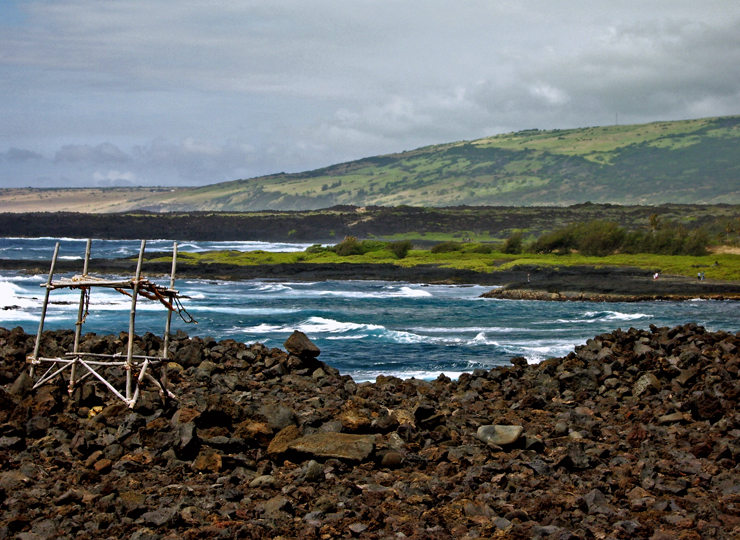 The small, but extremely well-preserved, Kalalae Heiau is classified as a ko’a, or fishing shrine, to the god Ku’ula. Just below the shrine and in the rocks to the west, one can find grooves and holes cut into the rock. These are attachment and guide points for anchor lines for ancient fishing canoes. 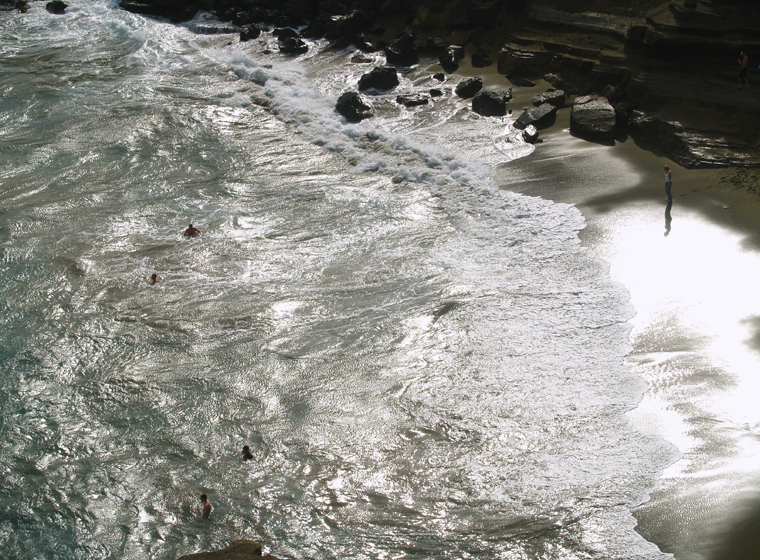 The currents at Ka Lae are so strong, and flow uninterrupted to Antarctica, that Hawai’ians could not fish and keep their canoes from being driven away simultaneously, so they fed ropes, secured to the rocks out to the canoes, to keep them from drifting away with the currents. 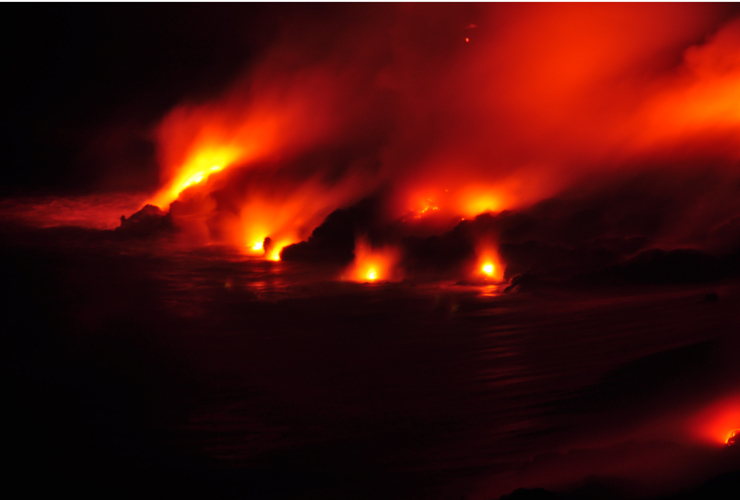 Like most animists, Hawai’ians invested worship and respect and intuited spiritual power in a range of natural objects and phenomena: rain, volcanic eruptions, the sea, sharks, fresh water springs, the surf and rocks, among many others. 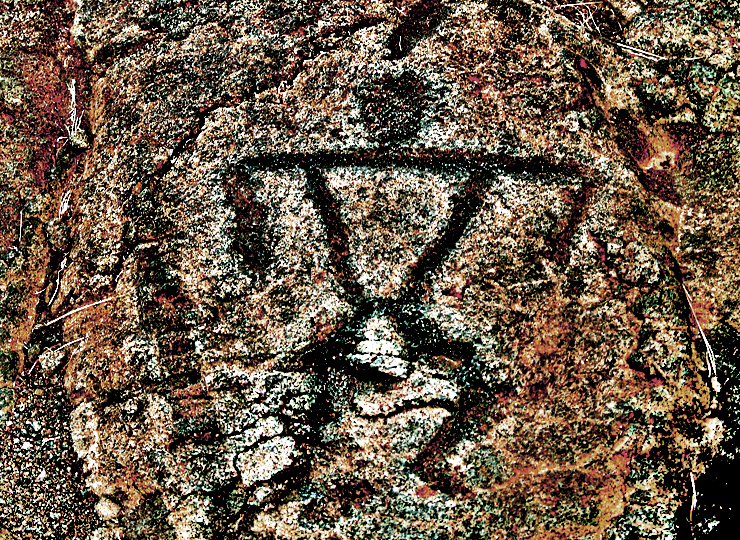 Pohaku O Kane, or sacred rocks, were among the most common spiritual objects of worship, whether they were naturally occurring in the landscape (pohakuia loa), or set on platforms (pohaku amakua) or carved (pohaku iki). 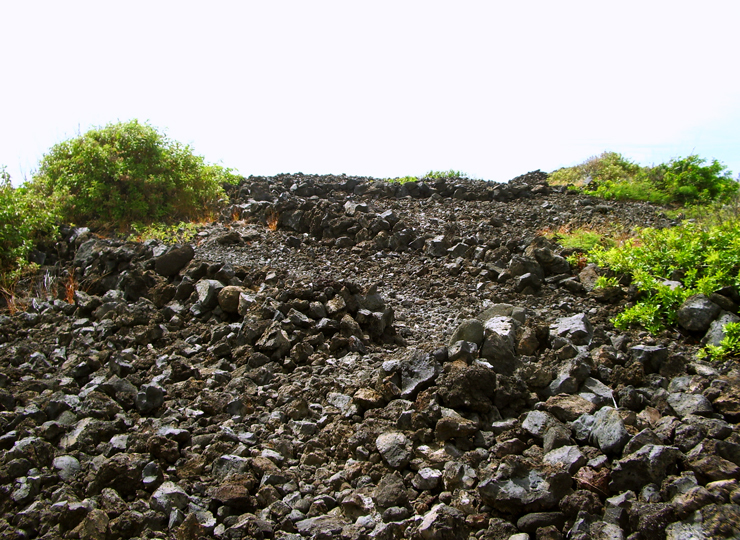 Kalalae Heiau has numerous examples of the former two. 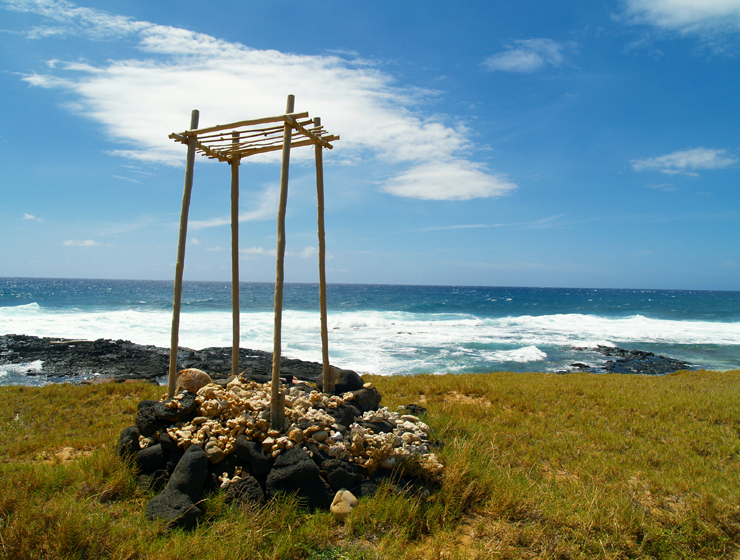 On the main platform outside the heiau is a pohaku amakua referred to as “Kumaiea” which means “female”. 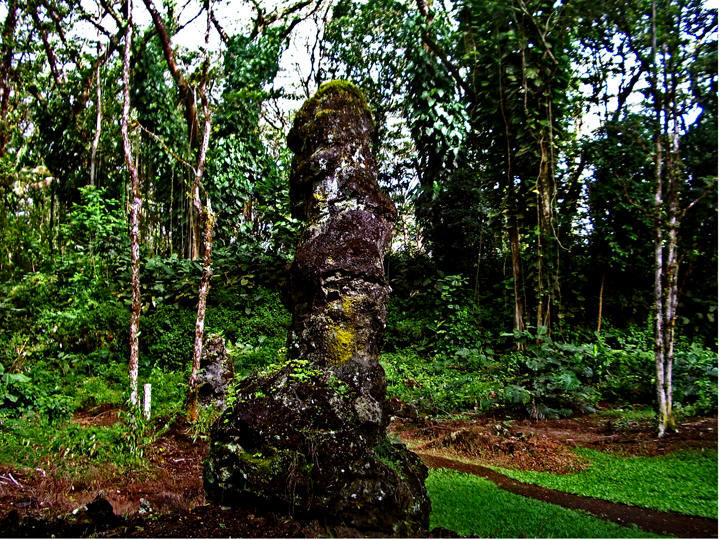 On the smaller stone terrace just north is another standing stone associated with the god Kanaloa and referred to as “Kanemakua” (male). 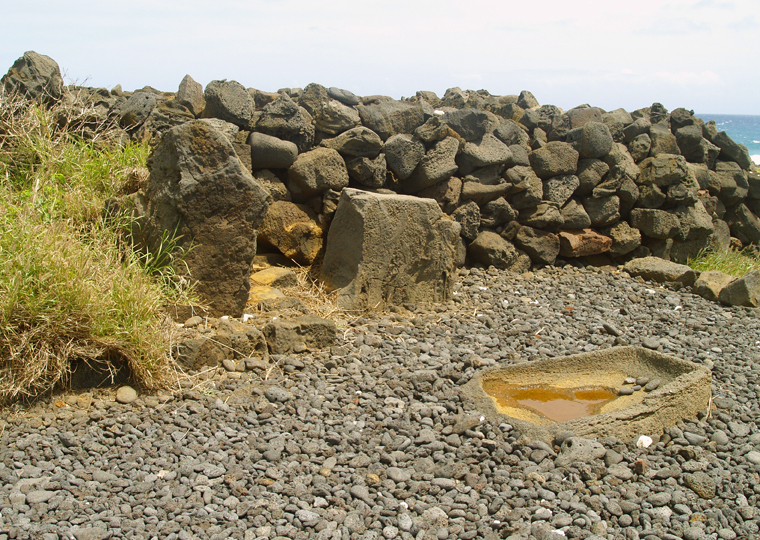 Inside the heiau wall is a stone called “Ku’ula” after the patron god of fishermen; north of the structure stand Makaunulau (named for a navigational star) and ’Ai’ai (a dependent or ward), south is Wahine hele (“place from where the women leave”). 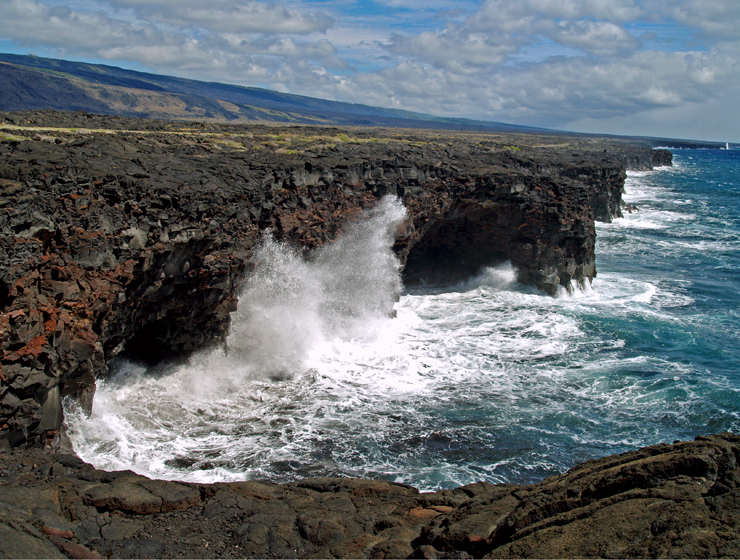 Examples of pohakuia loa include the Pohakuwa’a Kauhi (literally “canoe rock by the shrubs”) right at the shoreline, which was used to focus meditations before long canoes journeys, and Pohakuokeau (“stone of the currents” or “stone of the years”), which stands offshore. 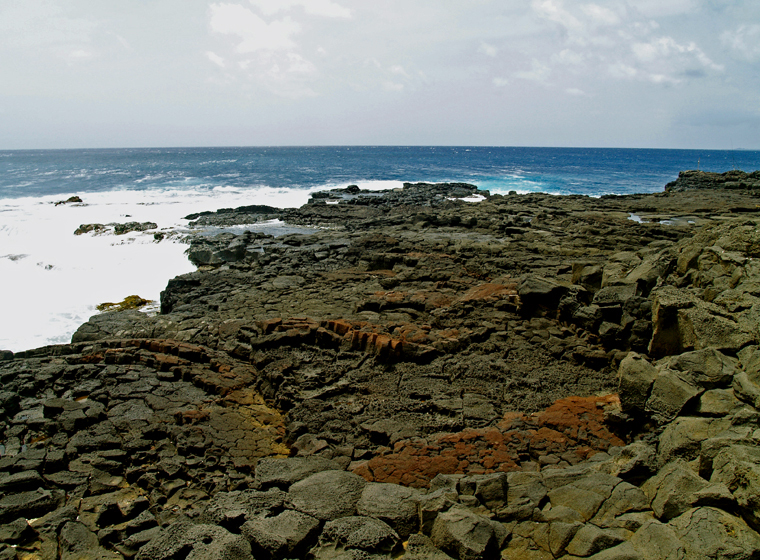 The name Pohakuokeau reflects the Hawaiian belief that the stones would turn over when there was a political change in government. Hike to Green Sand Beach: Absolutely unique to the island of Hawai’i, beautiful and strange, are the handful of green sand beaches composed of crystals of the semi-precious mineral olivine (also known as peridot). The green sand beach at South Point is the best known, largest and most accessible of these. 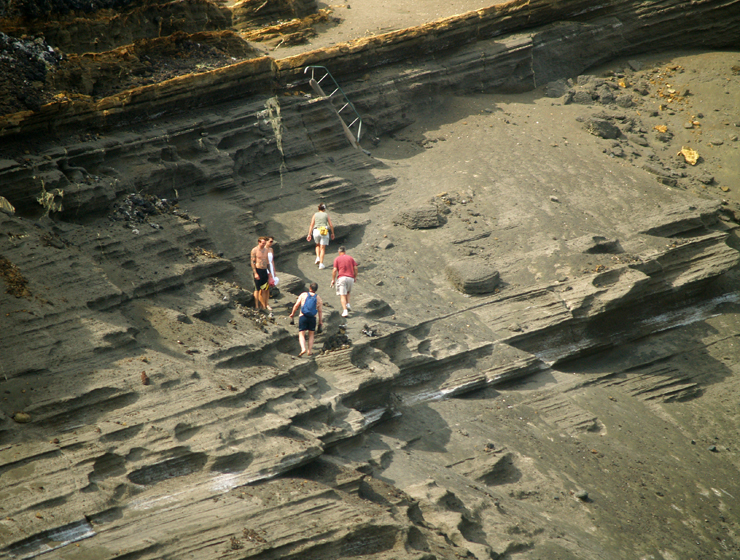 The sand grains on this beach are formed from olivine crystals weathering out of the lava and cinders from the cone over an eruptive vent that has been partially breached by the sea. 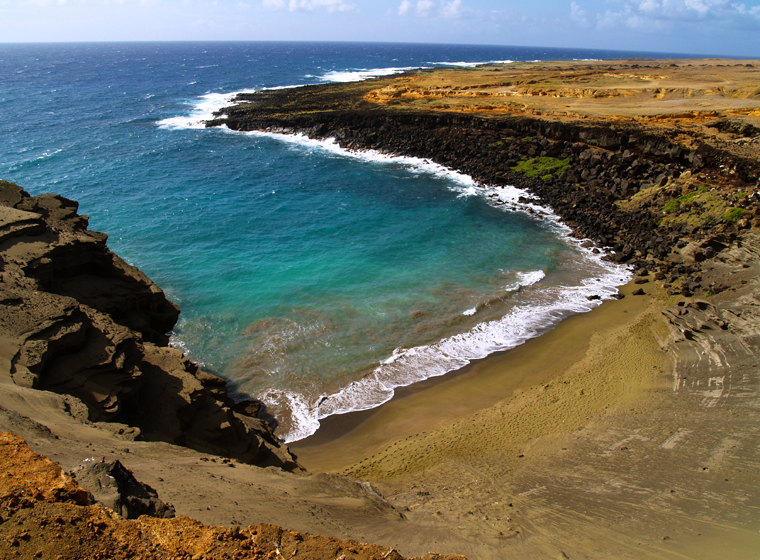 The beach lies in the interior of the cone, and the somewhat protected cove formed by the remnant of the cone makes for a wonderful swimming/snorkeling spot. Be very wary of currents and do not go out far nor in at all if the surf is high or there are strong winds. The bizarre color of the water shrieks for color photographs, particularly underwater photographs taken while snorkeling. 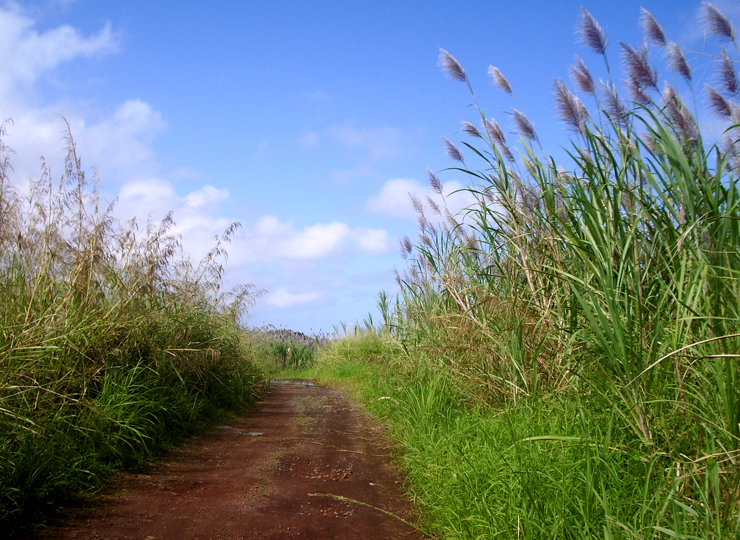 To get there, turn left onto a signed, patchy-paved and dirt road immediately when you arrive in the Ka Lae area following signs to the Kaulana boat launch. Proceed down the road and park just to the left (south) of the Kaulana boat launch, where there is a dirt road that leads to the green sand beach; there is gate ¼ mile down this road. 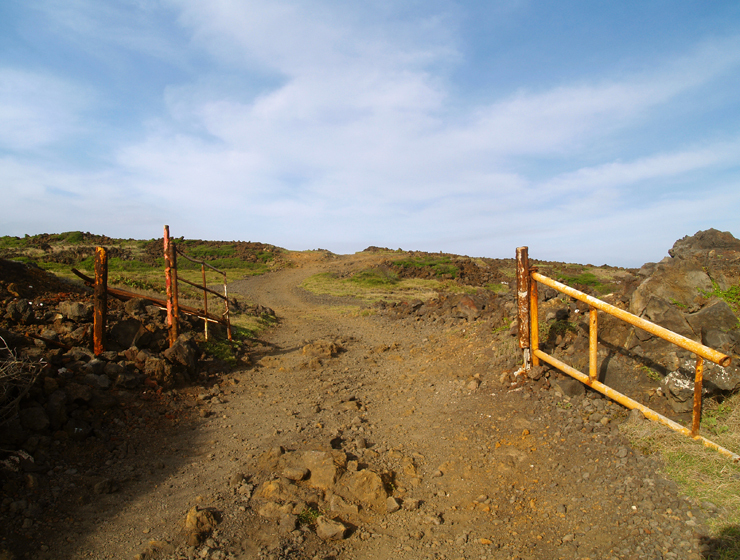 The gate is almost always locked and the road primarily provides access for hiking, ATVs or mountain biking: private vehicles are prohibited. Hiking distance is 2 ¼ miles each way along rolling tropical prairie (and if you cannot envision that, you really need to do this hike). 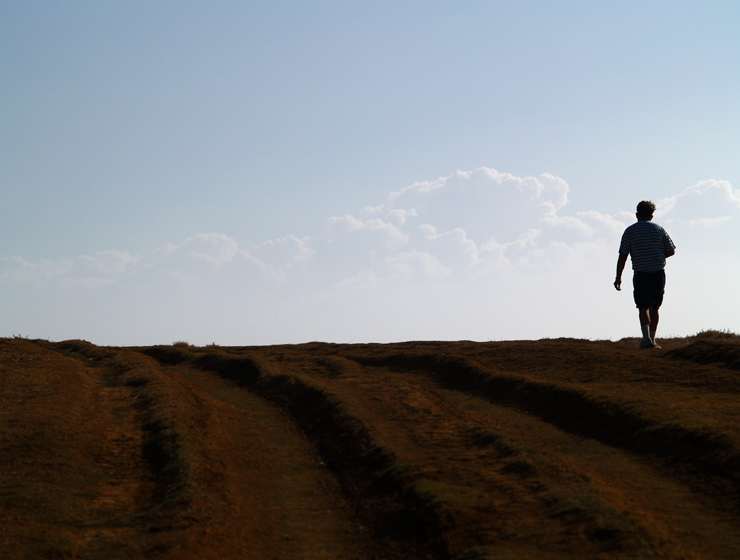 Despite the multiplicity of dirt roads, you really cannot get lost as you are never out of sight of the shore. 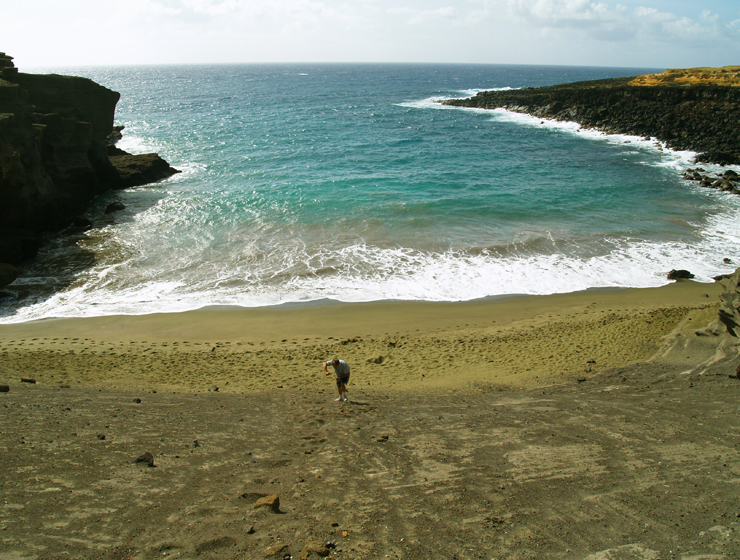 When you reach the end of the trail, you are a hundred or so feet above the beach on the rim of the remnant of the crater. Look closely for the faint track to scramble safely and easily to the beach (there is occasionally a blue trash barrel to mark this spot, but always there is a cairn of rocks). There is one sort of tricky spot where you have to inch your way over a 3-foot ledge, but almost anybody from senior to child can negotiate the hike to the beach. 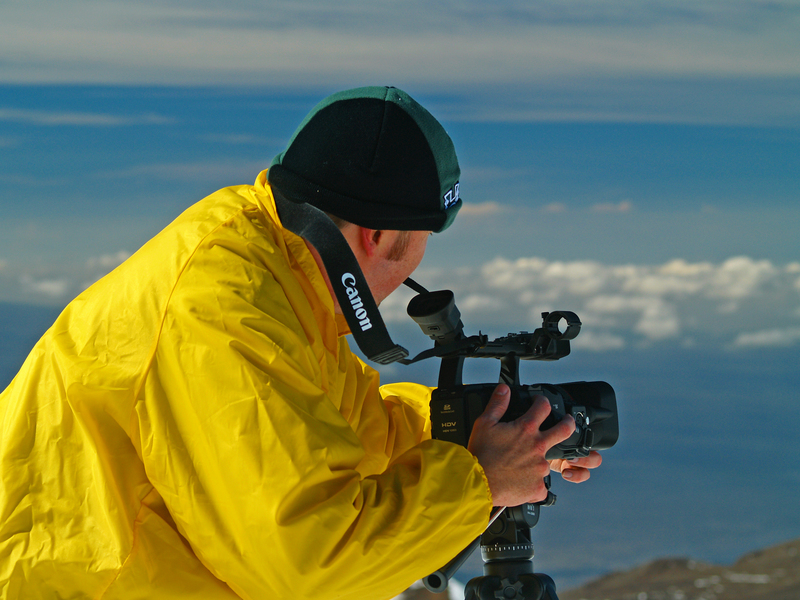 One can also easily scramble down from the middle (easternmost) of the cone where there is a short ladderway at the top, but this can be slippery. 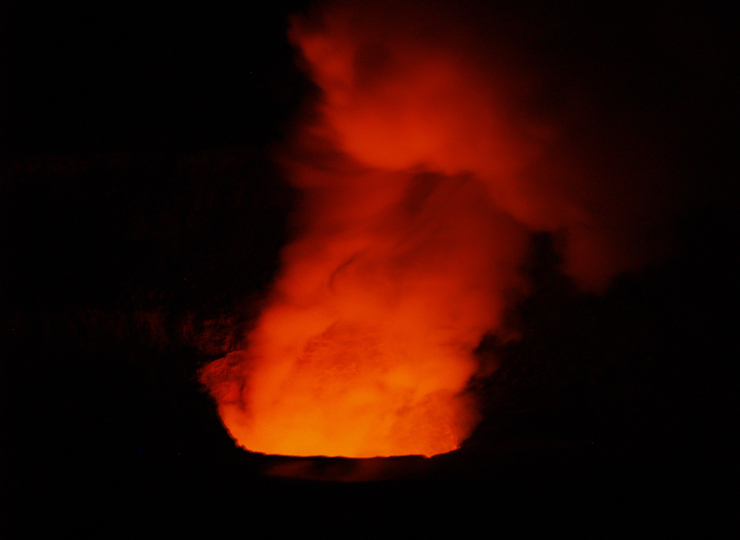 Although tricky to spot on the way down, from the beach looking up, either way back to the crater rim is easy to follow. There are no services. At all. None. And a goodly long way to drive to get to any…plan and act accordingly. 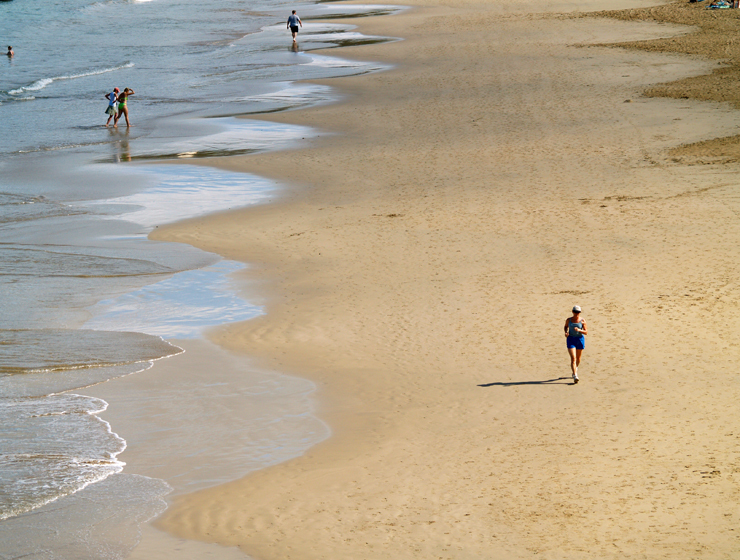 Even choosing which beach you want to spend time on, or where you want to hike can be an exercise in confusion and conflicting advice. 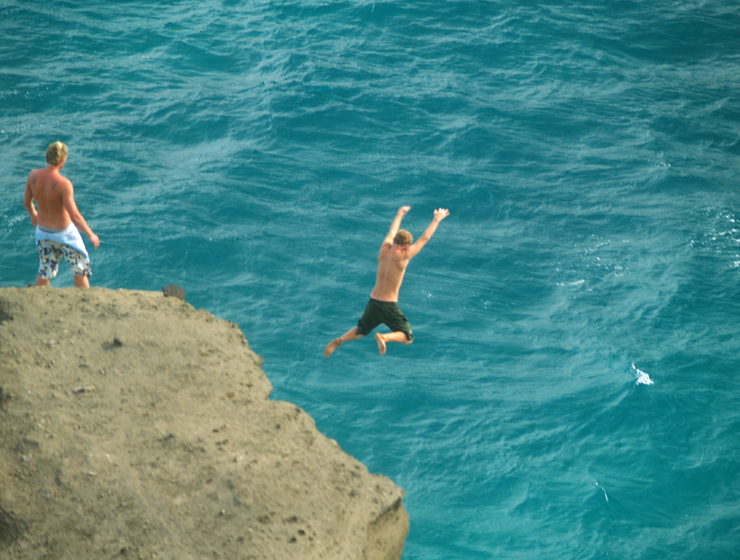 Clearly, visitors to Hawaii could use help making quality decisions about how best to spend their time. Tour Guide Hawaii is excited and proud to announce the release of their new GPS/WiFi enabled App for iPhone and iPod that helps you navigate your trip to Hawaii with hours of informative, location-aware video and information. 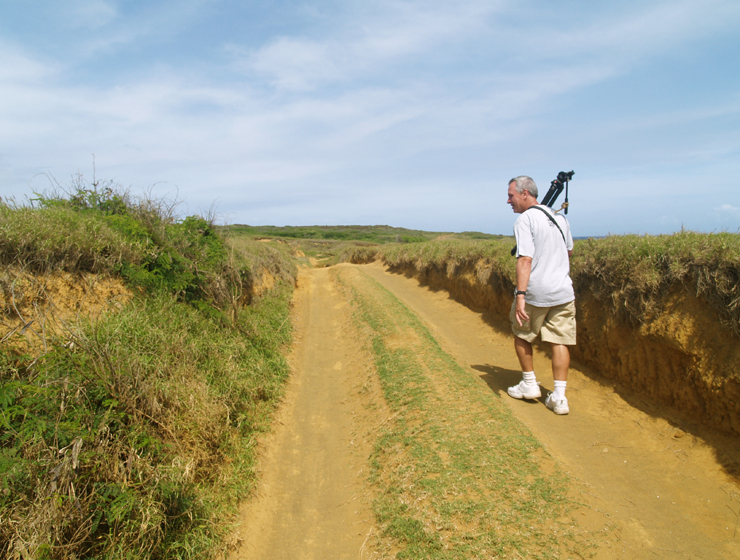 Although our video guide will lead you to dozens of unusual, untamed and unspoiled spots, let’s look at a hike you might have heard about, but might not be able to find from maps and guidebooks and would otherwise miss if you did not have Tour Guide Hawaii’s new App. 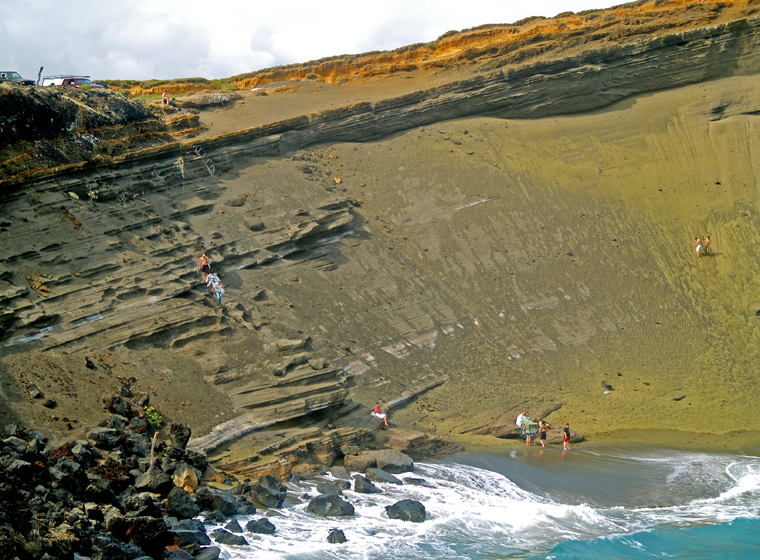 Absolutely unique to the island of Hawai’i, beautiful and strange, are the handful of green sand beaches composed of crystals of the semi-precious mineral olivine (also known as peridot). The green sand beach at South Point is the best known, largest and most accessible of these. 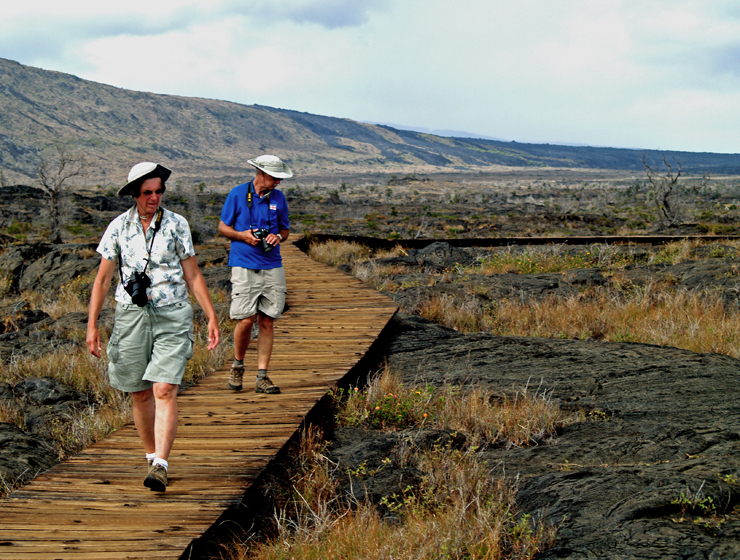 To get there, turn left onto a signed, patchy-paved and dirt road immediately when you arrive in the Ka Lae area following signs to the Kaulana Boat Launch. Proceed down the road and park just to the left (south) of the boat launch, where there is a dirt road that leads to the green sand beach. The road has a gate which is sometimes locked as the road primarily provides access for hiking, ATVs or mountain biking: private vehicles are, ostensibly, prohibited but are becoming more and more common—this is the reason for the multiplicity of washed out tracks. The two-track leading to the Green Sand Beach at South Point, Hawaii is perfect for mountain biking: Photo by Donnie MacGowan! We suggest you walk—it’s more enjoyable and it saves wear and tear on a delicate ecosystem. Hiking distance is 2 ¼ miles each way along rolling tropical prairie (and if you cannot envision that, you really need to do this hike). Despite the multiplicity of dirt roads, you really cannot get lost as you are never out of sight of the shore. Road conditions along the road to the beach vary dramatically from week to week and the road becomes impassable with even a gentle rain; this is another reason we do not suggest drive but rather enjoy the short, pleasant hike. About mid-way you begin to see the far side of the cone, out of which the bay has been eroded, poke up above the rolling grassland. 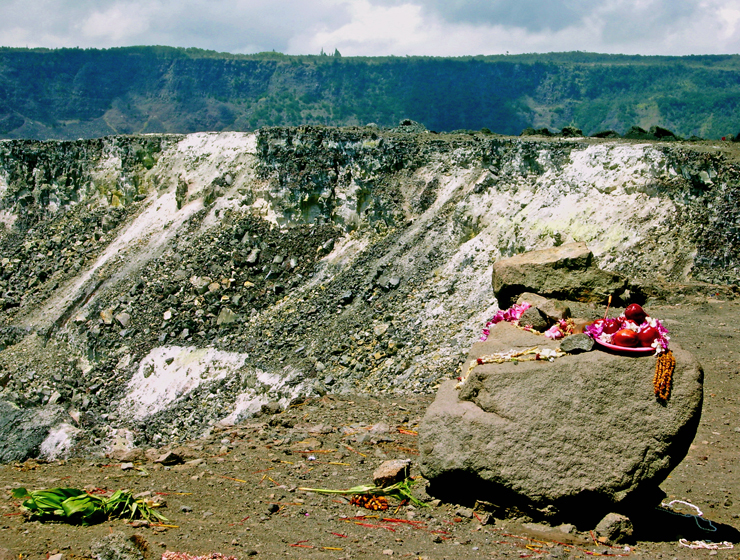 When you reach the end of the trail, you are a hundred or so feet above the beach on the rim of the remnant of the crater. 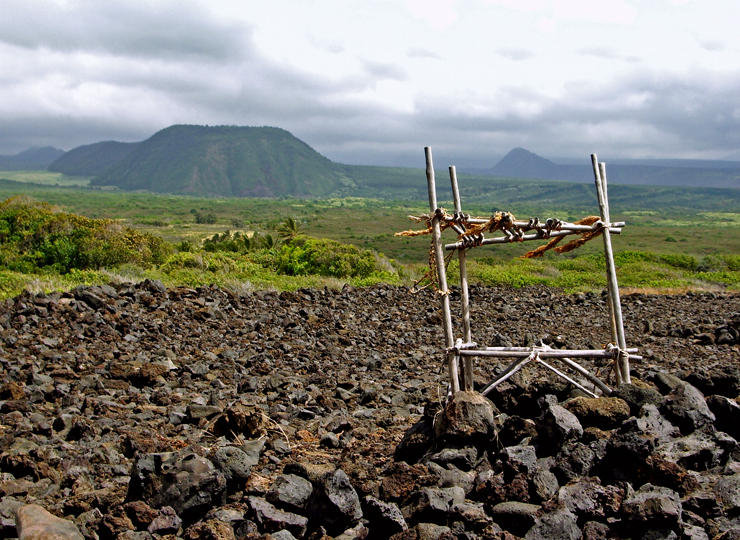 There is a weather-beaten, old sign about 100 feet from the crater rim that directs you to the path down. Look closely for the faint track to scramble safely and easily to the beach (there is occasionally a blue trash barrel to mark this spot, but always there is a cairn of rocks). There is one sort of tricky spot where you have to inch your way over a 3-foot ledge, but almost anybody from senior to child can negotiate the hike to the beach. One can also easily scramble down from the middle (easternmost) of the cone using a set of stairs, but this can be slippery at the best of times—even dangerous if wet. 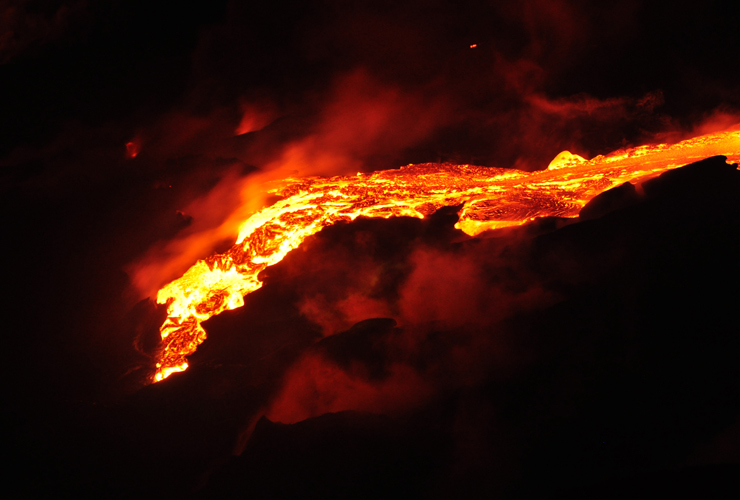 Although tricky to spot on the way down, from the beach looking up the way back to the crater rim is easy to follow. The sand grains on this beach are formed from olivine crystals weathering out of the lava and cinders from the cone over an eruptive vent that has been partially breached by the sea. 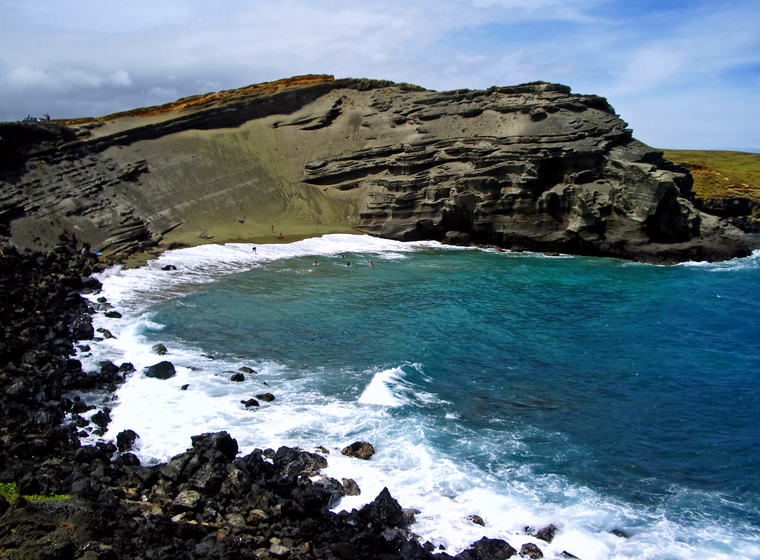 The beach lies in the interior of the cone, and the somewhat protected cove formed by the remnant of the cone makes for a wonderful swimming/snorkeling spot. 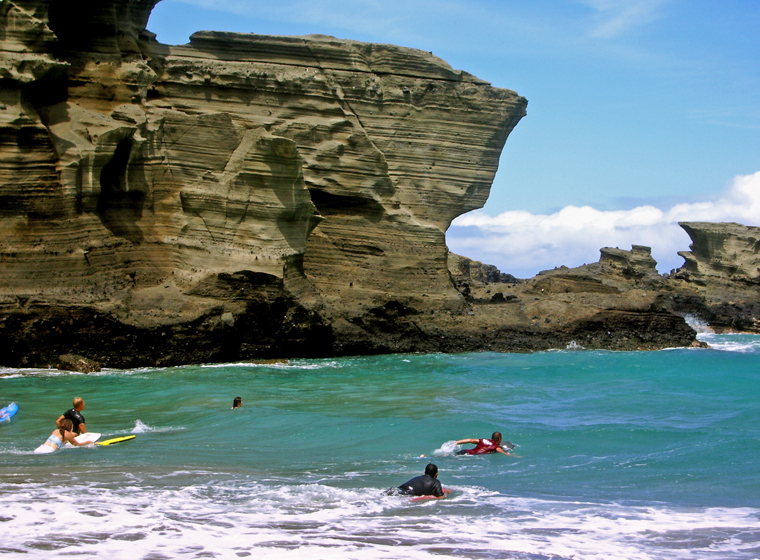 Swimming, snorkeling and surfing are delightful within the confines of the bay. Be very wary of rip tides and ocean currents; do not go out far nor in at all if the surf is high or there are strong winds. 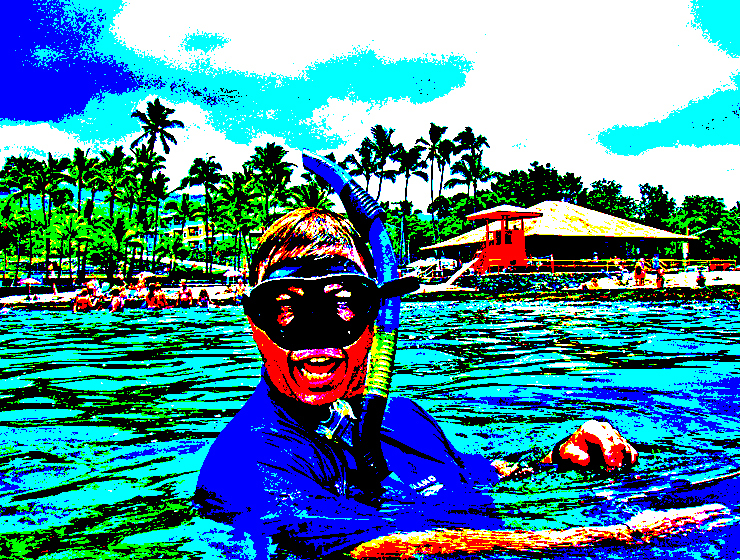 The bizarre color of the water shrieks for color photographs, particularly underwater photographs taken while snorkeling. No water is available anywhere along the hike or at the beach–be sure to take at least two liters of water per hiker for drinking. If you plan on swimming, you may wish to take an extra liter or two of water to rinse hair and torso, as well as a dry change of clothes. It’s miserable hiking in wet clothes with salty skin. Tour Guide Hawaii is proud to announce the release of their new iPhone and iPod Touch App available at iTunes…this App will help you plan your trip to Hawaii, help you decide what you want to see, how you want to see it and help you get there with GPS, interactive maps and on-board driving instructions. The Tour Guide App presents hours of interesting videos and information about places of historical, cultural and recreational interest, giving you a sense of the people, the natural history and the unique specialness of each destination. The information is so comprehensive and complete they even tell you where all the public restrooms are! What else will Tour Guide help you find? 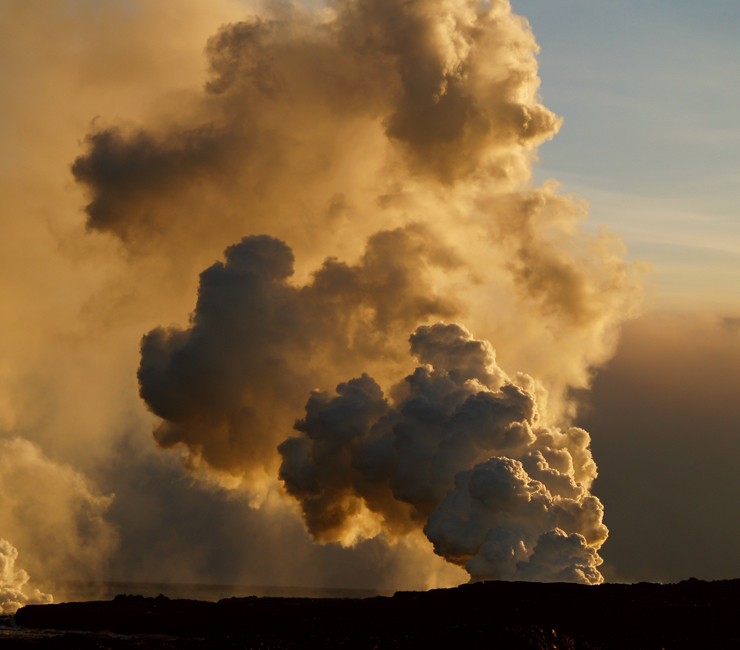 Let’s look at a trip south from Kona along the Hawaii Belt Road to Hawaii Volcanoes National Park…Tour Guide will not only help you find many amazing sights along the way, it will tell you all about them, what to take and what to expect. 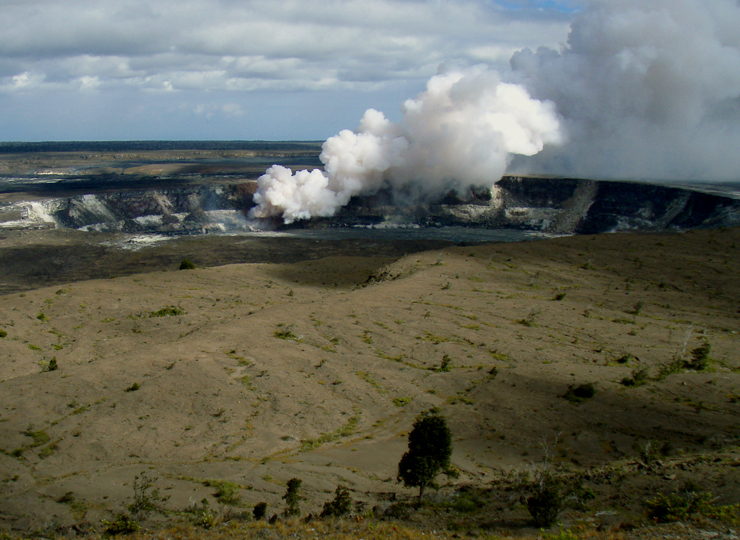 Today’s hints cover the area from Kona to Hawaii Volcanoes National Park, and the first few sites of interest within the Park. 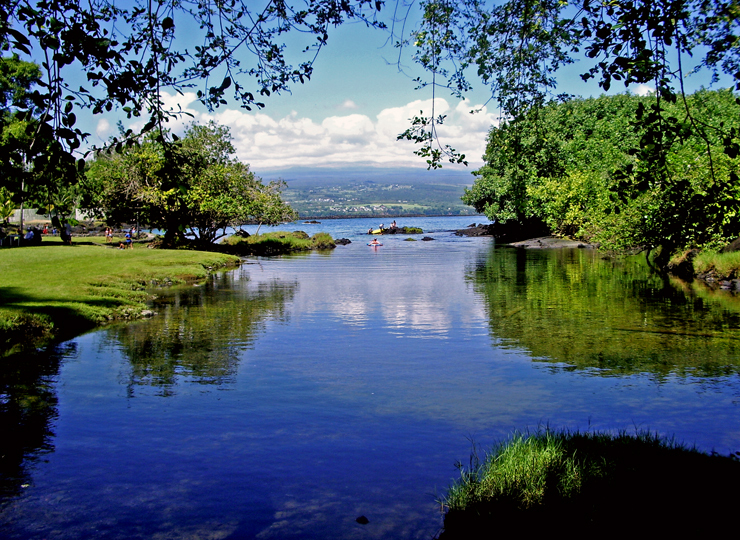 Driving along the Kona Coast and then south east through Ka’u, through tropical rainforest, across mysterious savanna and recent lava flows, there several fantastic places to stop and explore, but there is also a lot of lovely, open countryside for several miles, so enjoy the panoramic views. Your Tour Guide download from iTunes will give you more detailed information about this area. 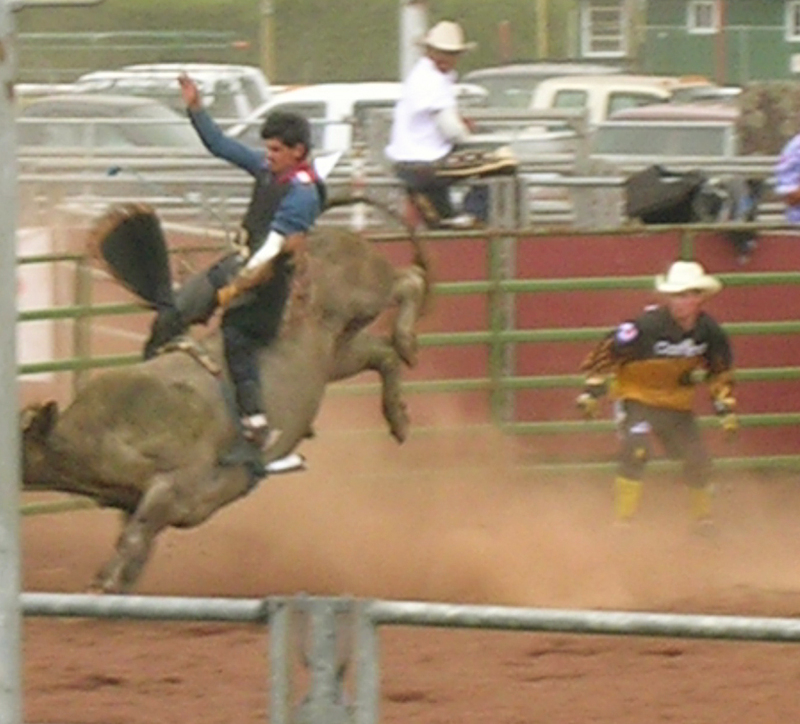 Copyright 2009 by Frank Burgess; photography copyright 2009 by Donald B. MacGowan. All rights reserved.